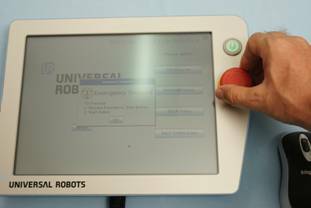 Accredited Universal Robots support Centre and Forum. 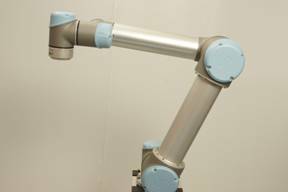 Authorized Robotiq and MiR distributor. 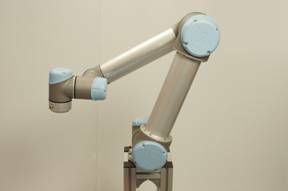 This manual provides some in depth and step by step introduction and use of the Universal-Robots. 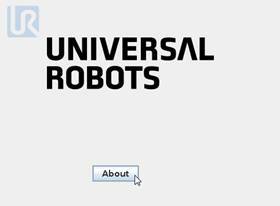 After reading this manual you will be able to use and program the Universal-Robot (UR). Aside from this manual there is the original UR user manual (manual_enx.x.pdf) wish also is very good and provide other detailed information’s for using the UR and it is recommended to read both manuals. Especially the reading the safety section and risk assessment is necessary to read before going any further. 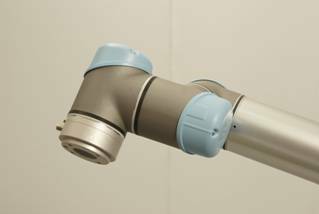 The UR is a very innovative and user friendly product and it is also interesting to know a little about the inside of the robot – especially when the covers are so easy to remove which can be done without any harm - however just look – don’t touch anything inside the joint or even turn any screws inside because the encoder can then get out of adjustment and the robot will malfunction and the warranty is void – so just close the lid again – see also photo at the end of this manual of open joint. 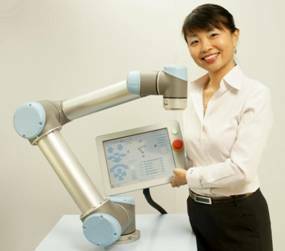 One thing you will experience very fast is that it seems that the robot has its own mind – which is also true but it is the mind of the programming team who made this robot, but they did a very good job. 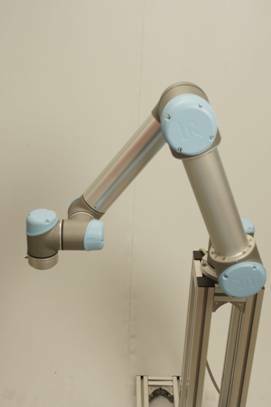 For example when two far away waypoints has been made then the robot will take a mathematically and physically possible shortest way from point A to point B – which is maybe not always what you expected. 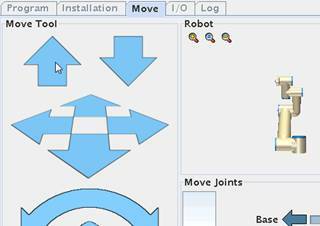 To control the path – you need more waypoints in between to force the robot to go through. The shortest way is also correct in most cases, but not always the case. 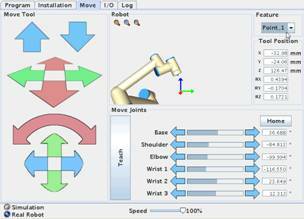 Because the movement can be influenced by the position of the joint. 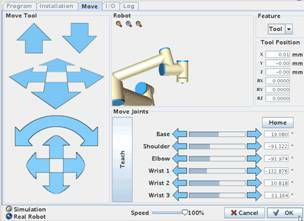 The joints can turn +360 degrees and -360 degrees if the joint is in its zero position as seen on the move screen (i.e. total 720 degrees). 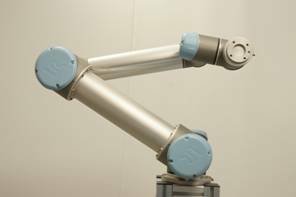 So how the robot move to next waypoint can be dependent on this. 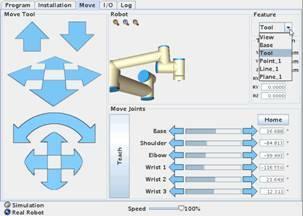 One way to explain this is - Consider the joint happen to be in the zero position at beginning of programming and if you have made several waypoints by only turning the base joint in only one direction e.g. left so point A = 0 degree, point B = 45 degree, point C = 90 degree, point D = 135 degree - and so on all the way up to 359 degree. 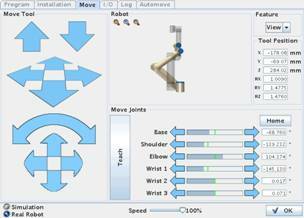 Now you want a point that is actually at position 361 degree – it is possible to make and continue programming - BUT when you run the program the robot will start nicely to turn around as you expected, but when moving from 359 degrees to 361 degrees it will swing all the way back and go to degree 1 – (always keep a hand on the E-stop when test running). 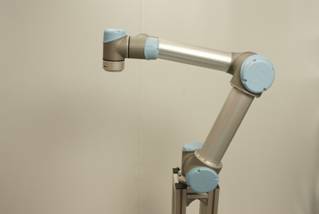 This is because the joints can turn +/-360 degrees. 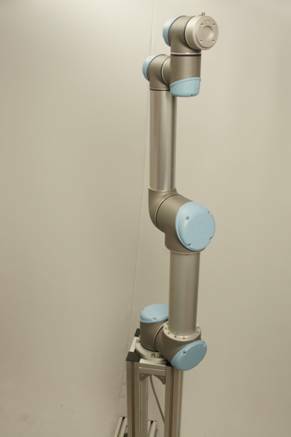 The UR robot is a 6 axis robot which means it can go to almost any position within each reach except directly above or directly below where it is sitting itself. 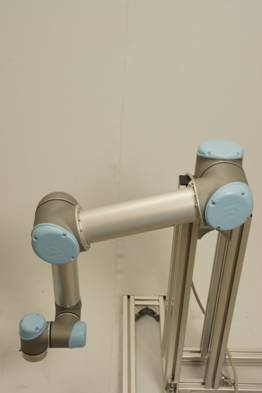 But it also has to be taken into account how the robot physical are constructed especially the length or the arms and joints. 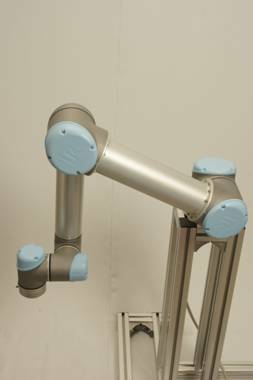 So just like a human body we might need to change our posture to grab something with our hand – so do the robot sometimes need to be re position by the programmer in order to reach the target. You might read the section about “Singularity” at the end of the manual. 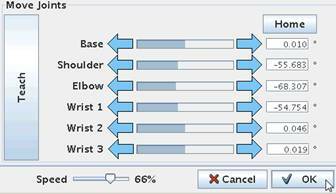 4 Install a USB Thumb drive. Although it is possible to store your user programs on the internal hard drive (Flash card in this case) I will recommend to dedicate a small USB thumb drive for your user programs. Because they are then very easy to carry over to your office computer for documentation and backup purpose and it becomes much easier to version control your programs. 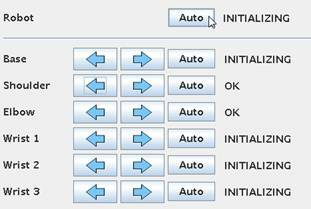 To save on the hard drive and on the USB drive will often lead to confusion for which is my correct and latest program? And to copy from the hard drive over to an office computer is tricky, but using a USB drive makes its very easy and convenient. Insert the USB drive in. Turn on the power by pressing the ON button on the monitor. Which normal and no action is need for this. If the emergency messages are shown - then turn the red mushroom button clockwise. 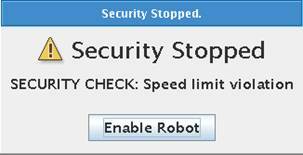 5.1 Turn on the robot for the second time. 6 Menus and finding your way around. 8 Move screen - The Home Position. 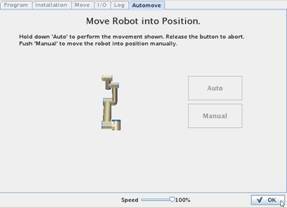 If there are obstacles near the robot and there is a risk the robot will crash into these obstacles during an “Auto” move – then you can choose a “Manual” move. 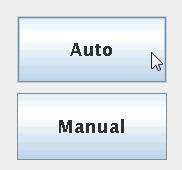 Press the Manual button instead - which brings you to the Move Screen. 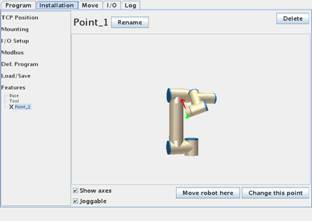 Here you have full control of the robot movements by pressing the arrow bars and you can safely guide the robot into the “Home” poison and away from obstacles. 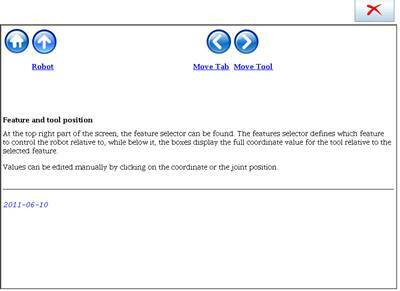 8.1 Move screen - Moving the joints individually. 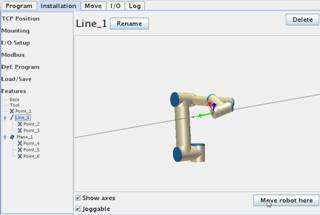 8.2 Move screen - move the robot linearly. 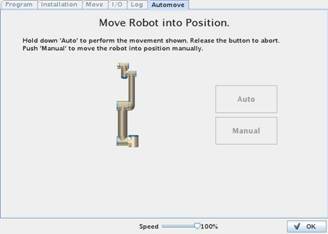 8.3 Move screen - move robot in relation to tool head position. 8.4 Move screen - Speed regulator. 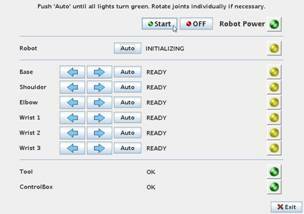 The speed adjustment” accelerator” 0 – 100% is meant for commissioning and troubleshooting. 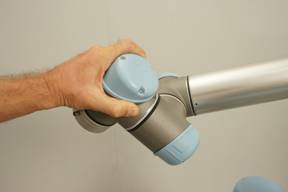 It is very useful to use when the robot is being manhandled and to check “what is really going on” in slow motion. But a funny thing to be aware of is that if you have made “Wait” instruction in your program – let’s say Wait 3 seconds – and then if you turn your speed down to 50% - then guess what – your wait instruction became 6 seconds – maybe not what you expected. 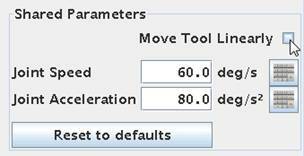 8.6 Move screen - X, Y, Z indicator. 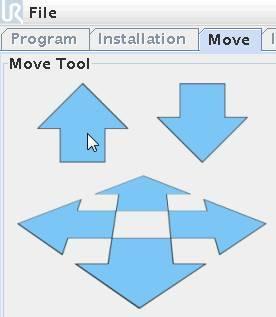 8.7 Move screen - simulator view. 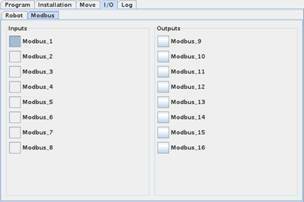 10 The I/O tab view. Digital Outputs are Open collector type. Open collector means that the outputs are implemented to ”sink” and we can say they are ”Active low” because connecting an actuator can be done by applying the supply voltage at the ”far” end of the actuator connections and the other connection to the output terminal - and then when the output is driven low by the programmer – the external device turns on. The log Screen can be reach by pressing the “Log” tab. 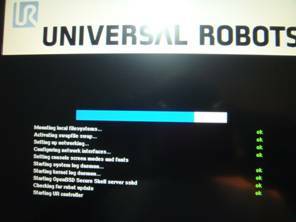 The log screen provides useful information’s about the status of the robot and controller. 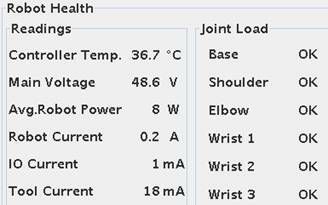 Information’s for controller temperature, consumption, power supply output and joint status is available. 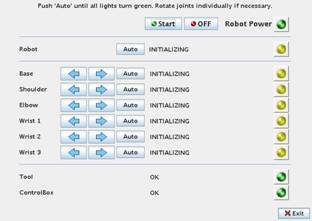 Below is a running system log with information of resent status and activities. 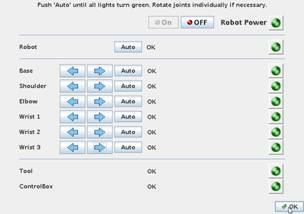 The control buttons are available for running or single step the program and the log entries can be observed while running which is useful for troubleshooting purpose. 12 Start programming Lesson 1. 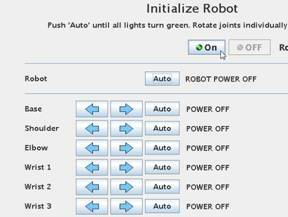 The robot can be programmed in different ways. 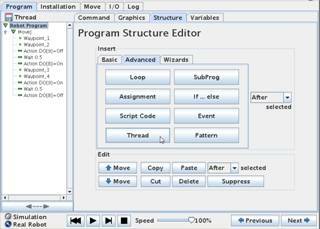 From this onscreen method or remotely by script programming. In this chapter we use the user friendly touch screen method. 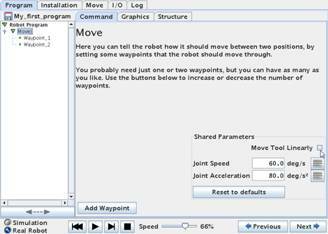 The robot has two ways of calculating how to move from Waypoint to Waypoint which is a Non linear movement (MoveJ) and a linear movement (MoveL). 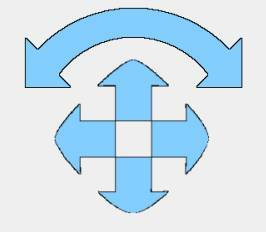 The “J” symbolizes the rounded nonlinear move mode and the “L” symbolizes the linear move mode. 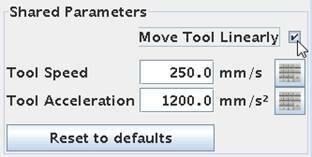 The non linear (MoveJ) is the default and the most commonly used and the one to recommend using if it is not absolutely a must to use a linear move. 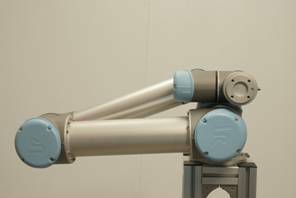 The difference is the way the robot calculates and how to move to next position. 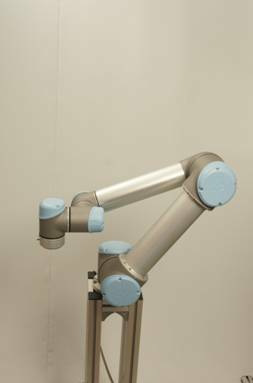 In the non linear (MoveJ) method the robot might seem to take a slight bended route from point A to point B – this is because of the physical construction of the robot – the lengths or “arms” and “wrists” combined with when the motors are turning. This is normally not an issue in normal pick and place operation and can easy be overcome by inserting more waypoints – like mentioned above. 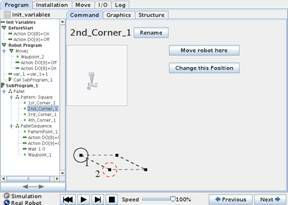 12.2Programming - First Program – MoveJ (Non Linear Movements). Now again Press the “Waypoint button. 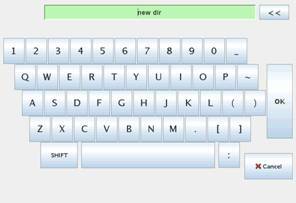 the arrow keys on the bars. the “Up” key in the Move Screen. 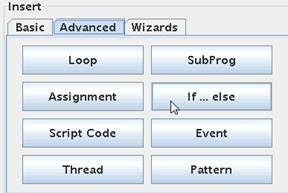 13 Programming – Single Step. The teach pendant looks like a Tape recorder or CD controls i.e. 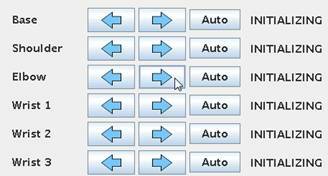 Play – Stop – Pause - and Step buttons. 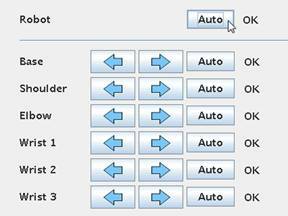 The Single step button is also for commissioning and trouble shooting because when you single step through your program it is a Single step of Program lines. So again – if you expect your program to be executed when single stepping – you will be surprised because the conditional expressions will maybe not be executed as expected – e.g. if you have programmed that a subroutine should only be performed when an input is High. 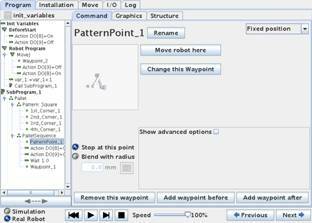 But then when you single step your program – the robot will follow your commands step by step move from waypoint to waypoint when you single step. 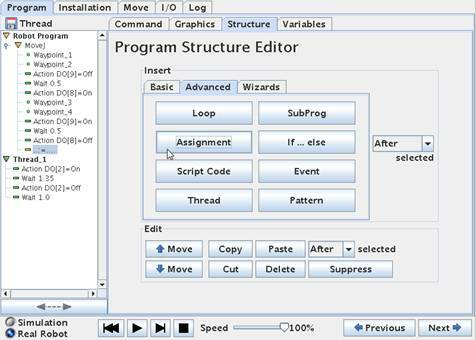 13.1Programming - Speed regulator during program run. The speed adjustment” accelerator” 0 – 100% is meant for commissioning and troubleshooting. 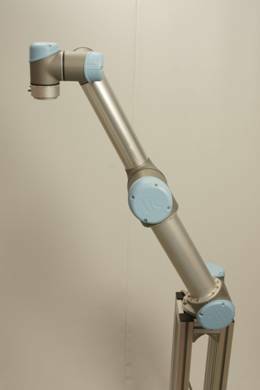 It is very useful to use when the robot is being manhandled and to check “what is really going on”. But a funny thing to be aware of is that if you have made “Wait” instruction in your program – let’s say Wait 3 seconds – and then if you turn your speed down to 50% - then guess what – your wait instruction became 6 seconds – maybe not what you expected. 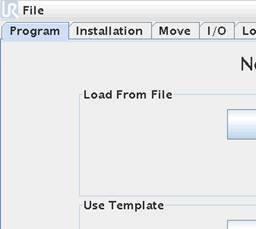 13.2Programming - Save the file. 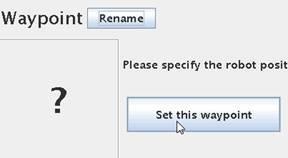 Press “OK” when finis typing. 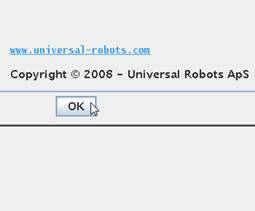 Notice after pressing “OK” the file name is listed below on the Screen. 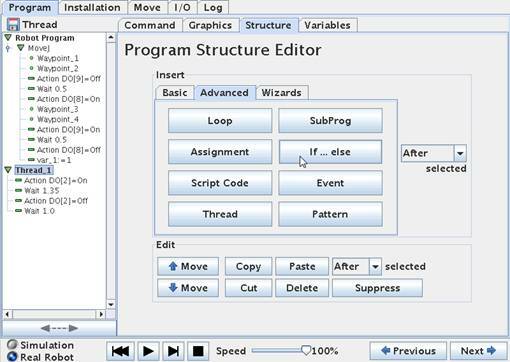 14 Programming - Load a program from USB drive. 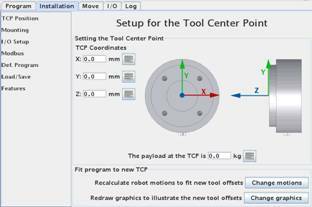 14.1Program environment tools and indicator. If not already in the Command view then - Press the “Command” tab. 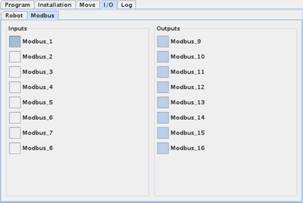 15 Programming – Lesson 2 – Inputs and Outputs. 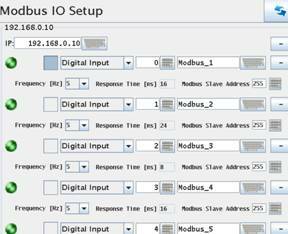 15.1 Reading Inputs and Setting Outputs. 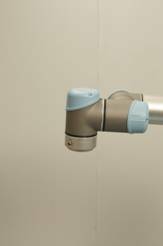 When using the robot the movements is important, but evenly important is to be able to handle inputs and outputs so the robot can react to external conditions and grab and hold items and feed back when the robot finish its task. 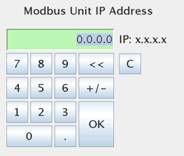 Therefore the controller software also can handle such I/O interface and this chapter will explain how to set an output and how to read an input and take an action based on such inputs status. We will continue to use our program we already started on – or you might wish to start a brand new user program. 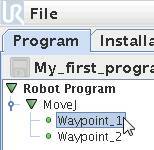 This example starts with a program that already has two simple Waypoint position like our “My_first_program.urp”. 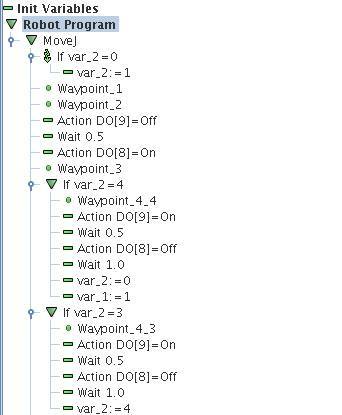 Since we already have to program lines then we need to decide where we want to have out action. 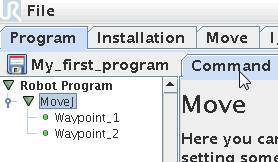 In this case we want it in between the two Waypoints so we place the cursor by pressing the first Waypoint. 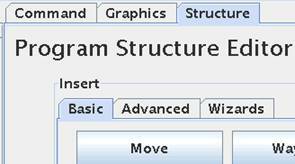 Press the “Structure” tab. 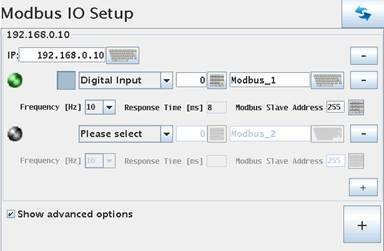 This time choose an “I/O Action”. This causes an “Action” statement to enter our program. Still yellow because it is not defined. Make sure the “Action” line is highlighted and Press the “Command” tab. We need to define the action. 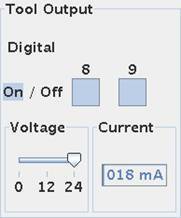 In this case we want to set an output – so tick the “Set Digital Output” bullet. Along with the output number we have to define the status we want to output to be set to. (High or Low) (On or OFF). Try and choose ”On” which will set the output high. 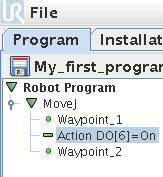 Notice that the “Action” statement line turn green and the output name and action associated with it which means it is now defined. 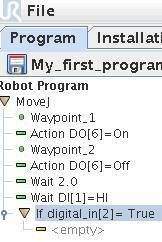 Continue programming we wish to control the same output after the robot has moved to the Waypoint_2. 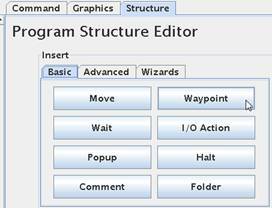 Press the Waypoint_2 and go to “Structure” tab and pick one more I/O action. 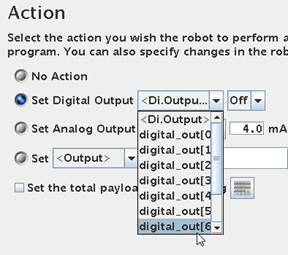 Press the “Command” tab and again choose “Set Digital Output” and select digital_output, but this time set it to OFF. 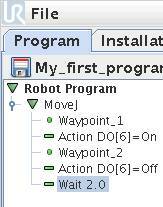 Continuing programming we wish to have a Wait instruction at this stage in the program. 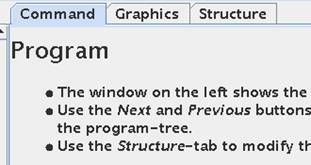 Press the “Structure” tab and choose the “Wait object. Now a “Wait” statement enters the program block. 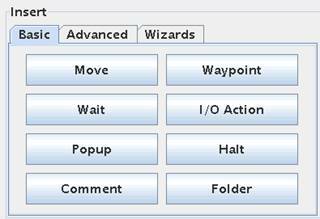 Make sure the Wait is highlighted and Press “Command” tab to define the “Wait” statement. In this case we want to have a flat Wait based on time for 2 seconds. Tick the “Wait 0.01 seconds” tab. 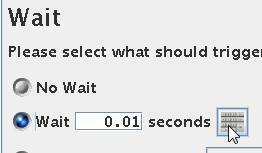 Press the “Keyboard” symbol in order to define the Wait time. The Wait time is pr. 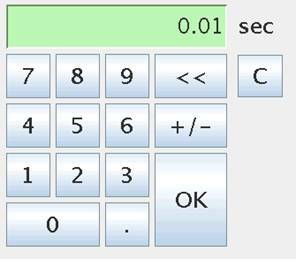 Default set to 0.01 sec, but you can set it to a new value e.g. 2 seconds. Press “2” and “OK”. Now the “Wait” statement turned green and is defined as 2 seconds. A wait can also be defined as a Wait for a condition to happen e.g. 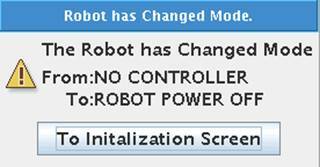 a change in an input status. Press “Structure” tab and insert one more wait instruction. 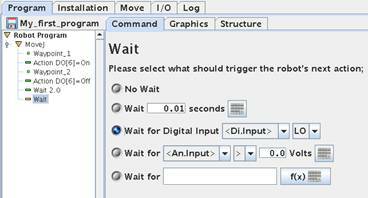 Press the “Command” tab in order to define the “Wait”, but this time choose “Wait for Digital input”. 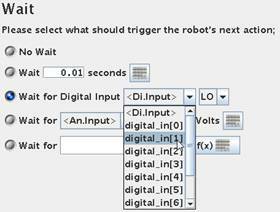 Select digital_input and select the status “Hi”. This means the program will wait until this condition occurs. This could be a signal from an external machine we are interacting with. 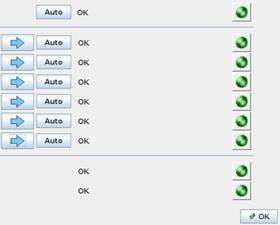 In our program block the second “Wait” statement also turned green because it is defined – although this Wait behaviour is different as the first one. 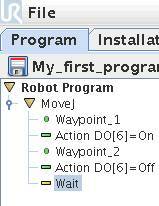 This “Wait” instruction we just made because the program to stop until this condition occur. Sometimes we still want to do other things while we are waiting for these conditions to occur. In such case we can choose an “IF” statement instead. 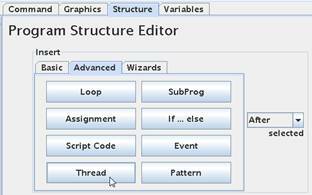 Press the “Structure” tab. Inside the “Structure” tab is three sub tabs. So far we have only used the Basic one. This time Press the “Advanced” tab. 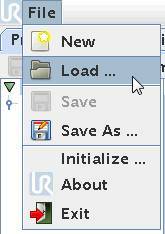 Inside the “Advanced” tab is more program objects to choose from. Choose the one that say “If … Else”. Notice how the “If ..” statement enters our program block. Still yellow because we need to define it. The “If” statement actually has two yellow markings because we need to set to parameters for the “If”. First the condition for the If to happen – and what to do when the “If” happens. Make sure the “If . .” line is highlighted. And Press the “Command” tab. 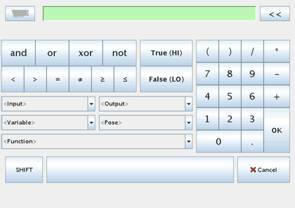 Now a Screen appears that has a “Formula” line because we need to set the formula for the “If” to react on. Press the f(x) formula tab. 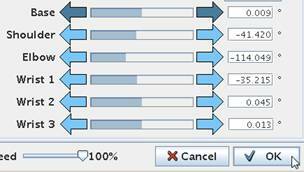 Inside the “Formula” screen is several functions to choose from. In this case we are looking at an input we want to react to. 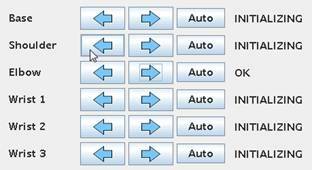 Choose the “Input” function. We need to choose the input we are looking at. 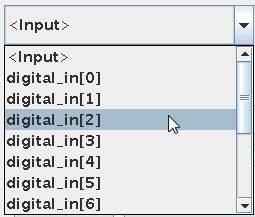 In this example Choose digital_in. 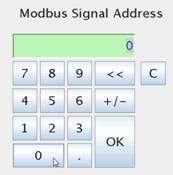 Notice how the input name appears on the formula line at the top of the Screen. 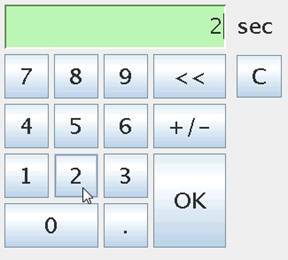 We need to finalize our formula and make it a condition – for example choose the equal sign. 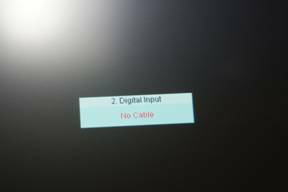 We want to react when this digital input 2 is “high” so choose “True (Hi). 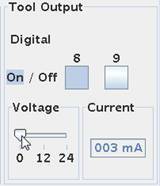 (The level of a digital signal can be expressed as 0, Low or False for a 0V signal or High or True for an active signal. 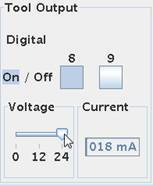 The level of the high can change depending of if we are using 12V or 24 control voltage. Press “OK”. The formula line has now the condition for the “If”. 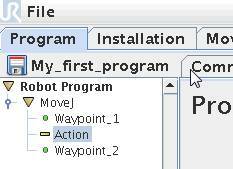 Also in the Program block the If statement became complete, but it is still yellow because the Action part of the If statement is empty i.e. not defined. Make sure the second part of the If statement is highlighted – in this case the “empty” line. Press the “Structure” tab is order to choose an object for our action when the If expression becomes True. 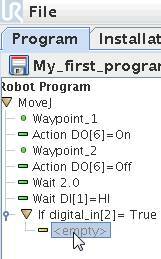 For example choose a Waypoint so if the If statement becomes true the robot will go to this Waypoint. 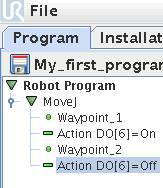 In the Program block the second part of the If statement now have a Waypoint as action. And the Waypoint needs to be defined just like all other Waypoints. 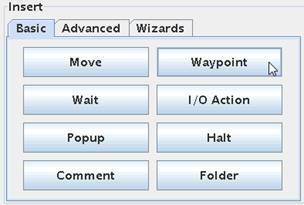 Make sure the Waypoint line is highlighted and Press the “command” tab. 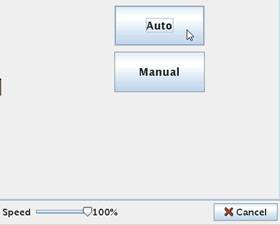 Now define the Waypoint just as normal described in the previous chapter – either by hand teach mode or by using the arrow keys. 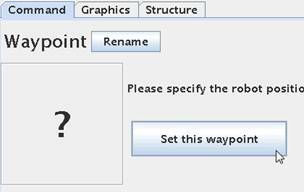 When satisfied with the Waypoint position – then Press “OK”. 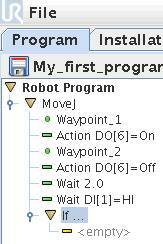 In the program block the Waypoint now becomes green and all statements are defined and the program is ready to run. 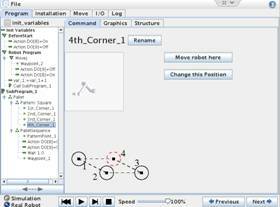 16 Programming – Lesson 3 – IF conditions. 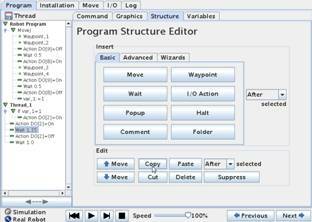 In programming one of the most used features is the IF or conditions based statement because that’s the hearth of automatic choice of conditions and this is very often then main purpose of computer program. In the UR we have the IF statement to use. 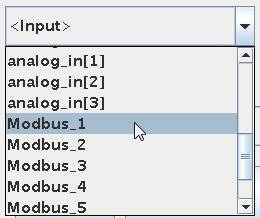 Define the IF statement by clicking on the formula button. 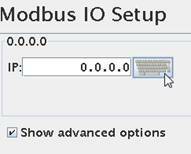 This will bring up a screen where we can choose conditions for the IF statement to check on. In this case we choose an Input to check on. 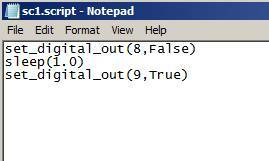 In this case it means that if Input 0 is true the IF statement is true and the lines in the IF statement will be executed. 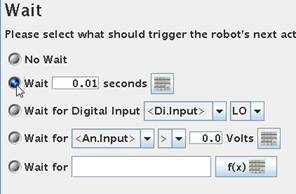 If this is checked the robot will check IF ”digital_in”= True is true also during the execution of the program lines in the IF statement. 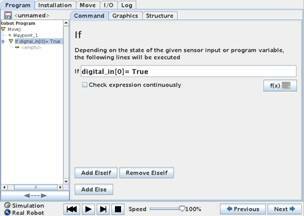 This means that if the ” digital_in” becomes 0 during the IF execution then the rest of the program lines inside the IF will not be executed. This can lead to unintended function if not handled correct. 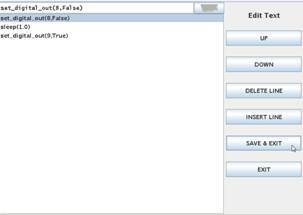 Below the IF statement program lines is to be inserted that will be executed if the IF statement is True. This can also be considered a program inside the IF statement and it can be as big as our main program, but often this is short and to set outputs that is dependant of the IF condition. In this case we choose to set a output high – wait 2 seconds and set it low again e.g. starting a conveyor for 2 seconds. 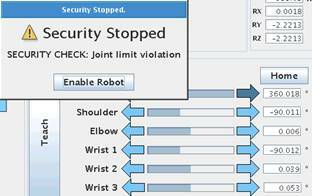 This is an explanation for what happens if the “Check expression continuously” is not handled carefully. 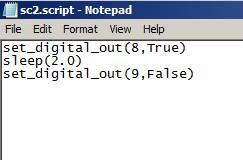 Instead of an Input we will check on a variable instead because then it is easy to see the meaning and difference. Initially the variable “var_1” is set to 0 – which means the IF statement is false and will not be executed – until we reach after Waypoint_3 – then the “var_1” is set to 1 and therefore the IF statement is true and we be started to be executed. 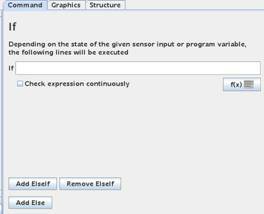 But in this case we have set the “Check expression continuously” checked. What happens now – is that the first few lines under the IF statement will be executed e.g. 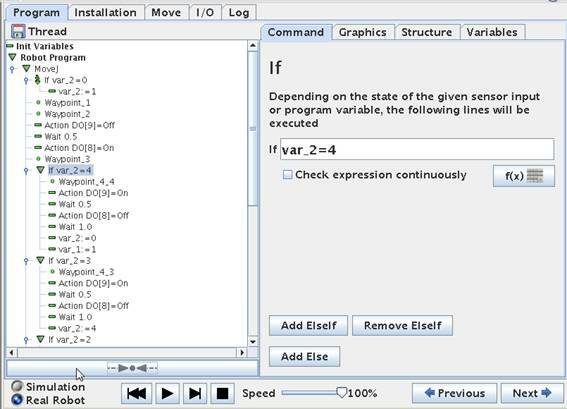 the Digital output 2 will go on, but when we reach “var_1 = 0” in the IF statement, then we actually change the condition of the IF expression check – which now becomes false – and therefore the program jumps out of this IF routine already – and the digital output 7 will never go on. Sometimes we will use Subroutines, but the effect will be the same. 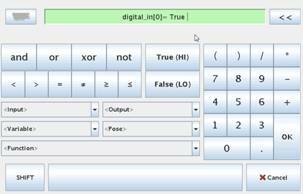 This program will do exactly like the previous program, but we have used SubProgram method and same thing - the Digital Output 7 will never go on although it says clearly so in the SubProgram, but the IF expression is already False. 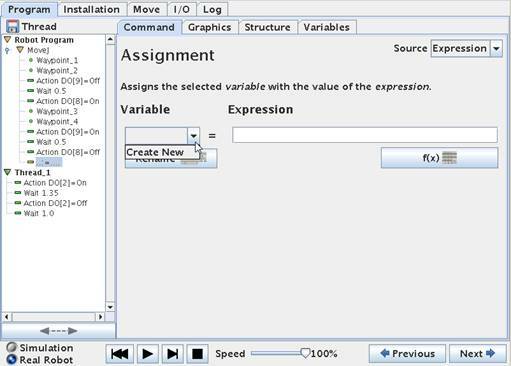 Here we have used a variable to show the effect, but it could as well have been a Digital Input we have used for the IF expression check – and the same will happen if the Digital Input state change while the program are executing the IF program lines – if the IF expression becomes False during this time – the rest of the program lines will not be executed. If such state changes right at the moment the IF was true – (but now false) none of the line in the IF statement are executed. In a conditional expression you can have combinations e.g. However instead of long mathematically statements – then better have more IF statements. 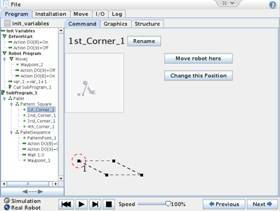 18 Programming – Lesson 4 – Special conditions. 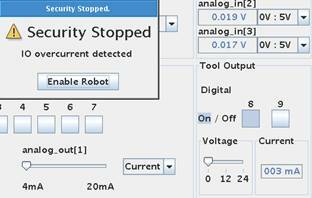 Sometimes when you program – and try to test run your program you will see an error messages something like this “Infinite loop detected”. This is because the program is syntax checking your program so if you have an IF expression for a condition to happen, but never programmed what to do if the conditions is not present – then you might see this error messages. The trick is to insert a “dummy” Wait instruction for what to do IF the expression is not present – just choose a very low value of the Wait e.g. 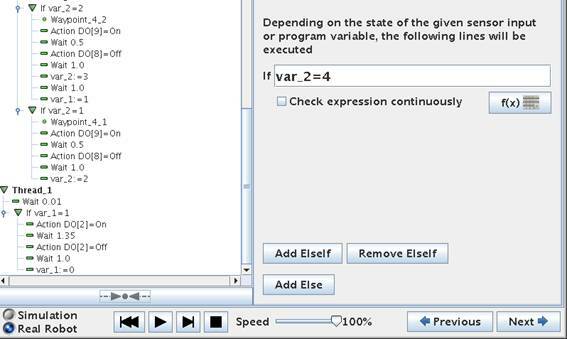 0.01 Seconds which pass very fast and the program will loop until the IF expression is true. 19 Programming – Lesson 5 - Files. 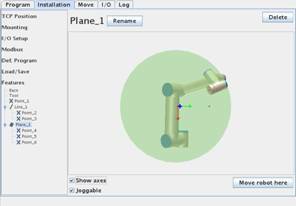 20 Programming – Lesson 6 - Templates. 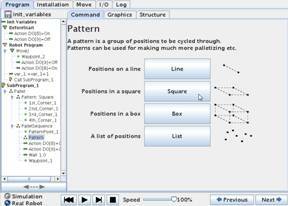 21 Programming – Lesson 7 – Before Start Sequence. 22 Programming – Lesson 8 – Variables. 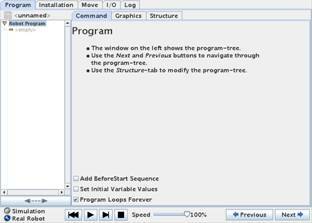 In the Program tree - Point on the “Init Variables” line and this screen appear. 22.2 Variables – Prefer to keep value from last run. 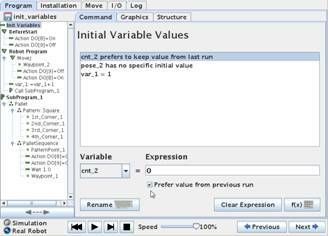 The Init Variables screen there is a feature called ”Prefer value from previous run”. 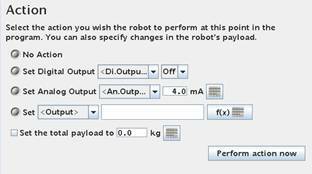 If this one is clicked for the intended variable then the robot can remember the value of the variable form last program run. 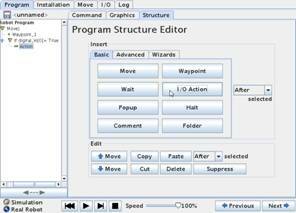 This is useful to keep track of positions that changes through the flow of the program. 23 Programming – Lesson 9 – Thread. 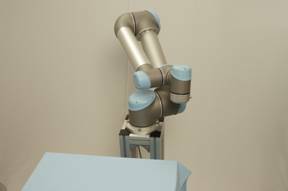 To control a conveyor that has a function related to the machine the Robot is tending can by advantage be controlled from the Robot program. One way to do this is to use the function ”Thread”. First lest assume we have a program that is tending a machine. In this small example below Waypoint 1 and 2 is at the machine and grapping a work piece. 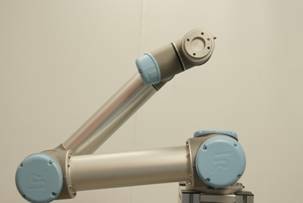 Waypoint 3 and 4 is at the conveyor and at Waypoint 4 the gripper is released and the work piece is delivered to the conveyor. 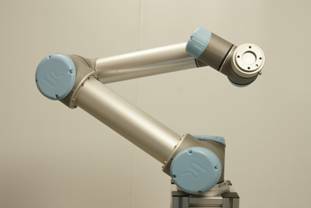 A Thread is a program sequence that is run in parallel of the main robot program and this can be totally independent of the robot task – or it can be related to the robot task – up to the programmer to choose. 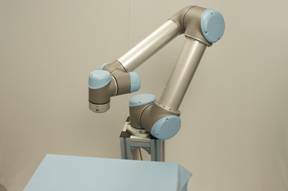 This program snippet is at the machine side, but the conveyor is not moving – and now we want to have the conveyor to move a notch forward after the robot has delivered a new work piece and then simultaneously let the robot continue its task while the conveyor is moving forward. 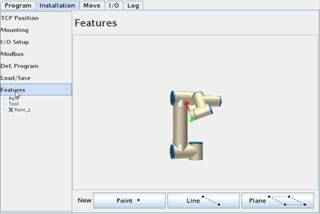 For this function we will use the ”Thread” which can be found in the ”Structure” menu and under ”Advanced”. Here we got an error messages because the Thread has to be at top level. 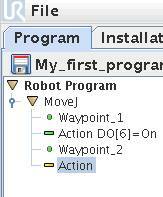 So we have to move the cursor position up and highlight ”Robot Program” in our program tree. Now a Thread statement has entered our program. It is shown below our Main program which is slightly confusing because we got told before that it should be at top level. 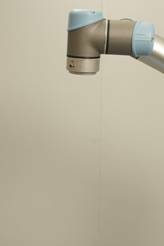 However it is more correct to say that the Thread is at the side of our Main program because it twill run in parallel with our main program. 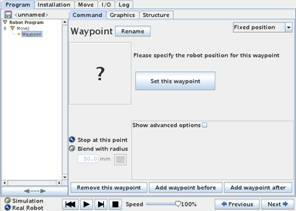 The Thread can be programmed exactly in the same way as our main program – and we can even have Waypoints inside the Thread, but then make sure that is intended in relation to the main program – otherwise the Waypoint action inside the Thread might conflict with the Waypoint action in the Main program (The robot cannot be a two positions at the same time). We want the conveyor to go on for a short while – and the off the conveyor again. 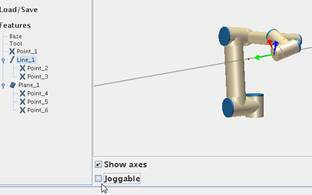 An example of this function is shown under the Thread above. This example assumes that the conveyor is controlled by out put DO2. There is a Wait in between the ON and OFF statements which is our conveyor run time. After the OFF statement there is another Wait because otherwise the conveyor would go ON immediately we stopped it – and the result would be a continuously running conveyor. 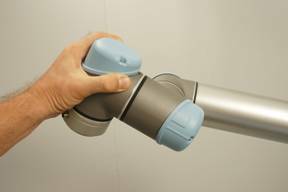 Although this will run the conveyor in 1.35 seconds in this case – it is still independent of the robot action – which is not our intention – so we need a little more programming. 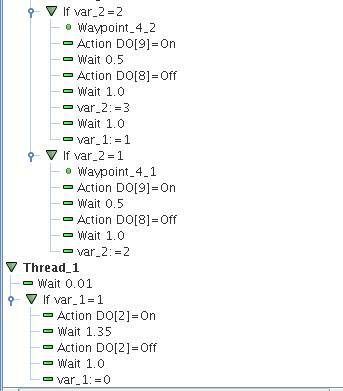 We need to synchronize the Thread with the Main Program and there are many ways to do it, but one way is setting a variable in the main program and then checking on this variable in the thread. The plan is to set a variable at a certain value in the main program at the time we want the conveyor to start – this is a flag to the Thread program. 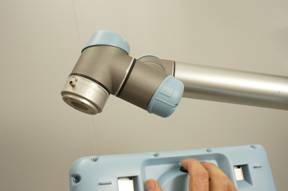 We have to identify in the main program – where is it we want the conveyor to move forward ?. 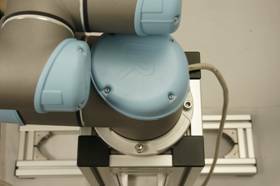 In this case it is after the robot has delivered the work piece to the conveyor – which is at Waypoint 4 and after we have released the work piece. 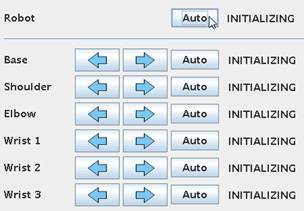 So we put the cursor there and go to ”Structure” – ”Advanced” and choose ”Assignment”. This will bring a ”=” (equal) sign into the program. We need to define the ”Assignment”. Click on ”Command” to get the property screen for ”Assignment”. This is our first variable so we have to create it. Click on ”Create New”. 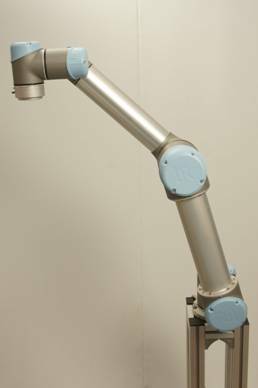 The Robot will automatically name it ”var_1”, but you can rename to your own preferred name, but often for trouble shooting and discussion with colleagues it is better to leave as the original name. On the right hand side is an ”Expression” field because we can assign the variable a fixed value or a value base don an expression – maybe base don the previous value of the variable for example to make counters. But in our case the variable is just a Flag to tell us where we are in the program sequence – so we just give it the value of ”1”. 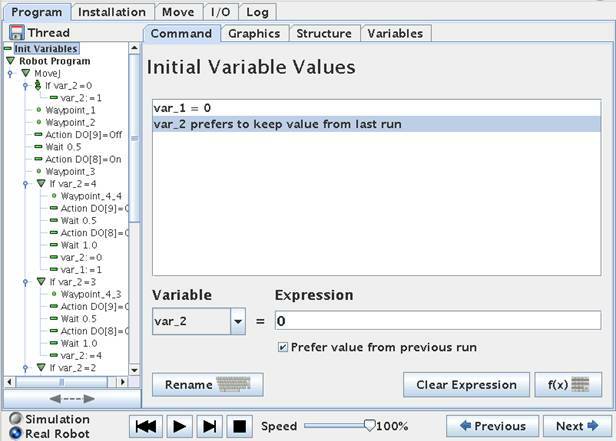 Note how the ”var_1” in the main program has been assigned to the value of 1. 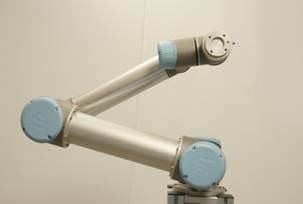 When the ”var_1” variable is 1 - it tells us that the main program has reach the point when the work piece has been delivered to the conveyor. That’s great because that’s exactly when we want the conveyor to start. So we will make the Thread dependant on this ”var_1” variable. Insert an IF statement into the Thread. 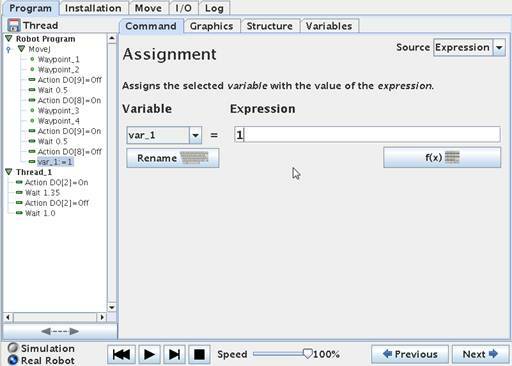 This will bring up a screen where we can choose the ”var_1” variable and choose to design our expression as var_1=1. 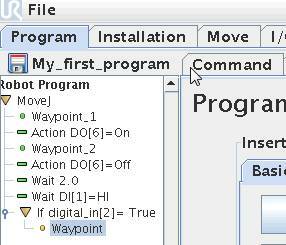 This means that only IF var_1 = 1 then we will execute the program line below the IF statement. 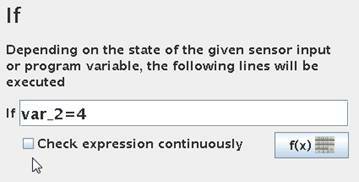 Make sure the ”Check expression continuously” is not ticked. 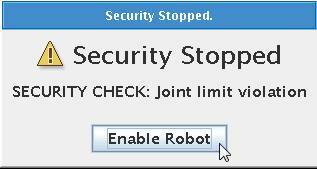 If this is checked the robot will check IF ”var_1”=1 is true also during the Thread execution. 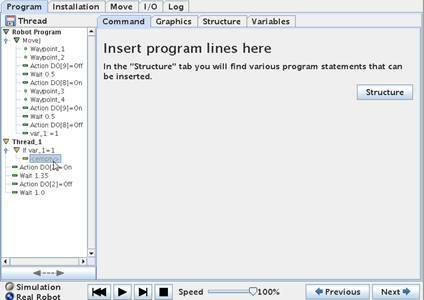 This means that if the ”var_1” becomes 0 during the Thread execution then the rest of the program lines inside the IF will not be executed. This can lead to unintended function if not handled correct. In our case we need to set the ”var_1” to 0 inside the Thread and if we do that on top of the program lines below the IF – then the rest of the IF program lines will not be executed. Now we have a little Editing work to do – because what we actually want the lines we originally had in the Thread to be under the IF statement (otherwise the lines will be executed no matter what is the result if the IF expression. 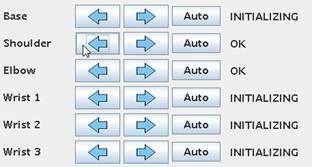 So we need to move those 4 lines up under the IF by using Cut/Paste or create them again. Notice how all 4 lines now is directly under the IF statement. 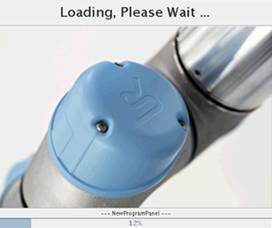 But we only want the conveyor to run one time – every time it is triggered. So we have to make sure our IF statement becomes False next time the program check the IF expression. Therefore we insert a ”Assignment” in the Thread where we zero the ”var_1” variable so it becomes False for the IF check. 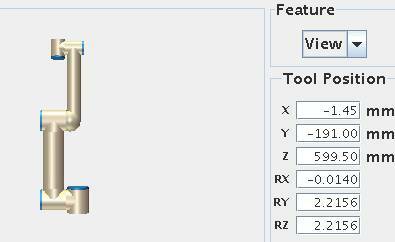 We set the ”var_1” variable to 0 in the property screen for the variable. 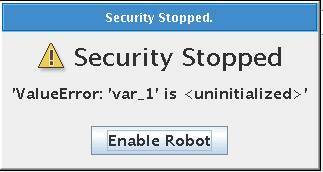 If you get this error messages it is because we need to tell the Robot – what should the variable ”var_1” be when we start the program. 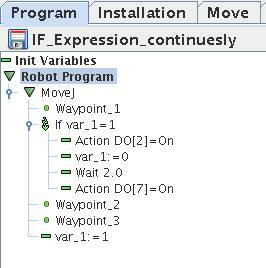 This is uncertain for the robot if we have not explicit set the variable before the program execution. And then tick ”Set Initial Variable Values”. 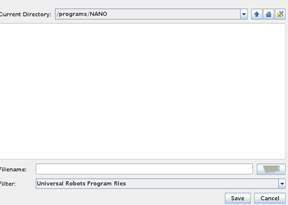 This will insert a line op top of the program called ”Init Variables”. 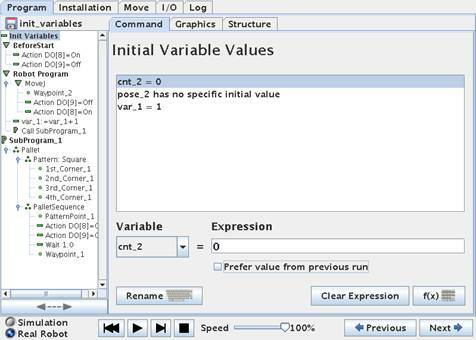 The Init Variables screen shows that the ”var_1” has no Initial Value. 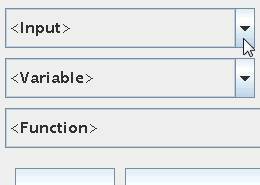 Below the messages box is a function to set variables. 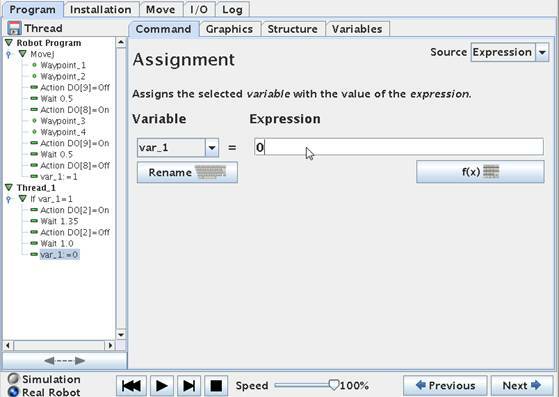 Choose ”var_1” and insert 0 in the Expression field. 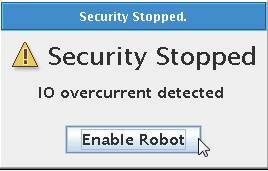 If you get this error messages is because the robot does not like to be caught in an Infinite loop. In this case the Thread program might be Infinite if the ”var_1” never change. So we do the trick by inserting a small and very short ”Wait” and put it at a very low value e.g. 0.01 seconds. This is done before the IF statement in the Thread – so the Thread has something else to do if ”var-1” is not 1. (In this case – to wait 0.01 seconds). The entire program looks like this below. This small program is working and the logic is like this. 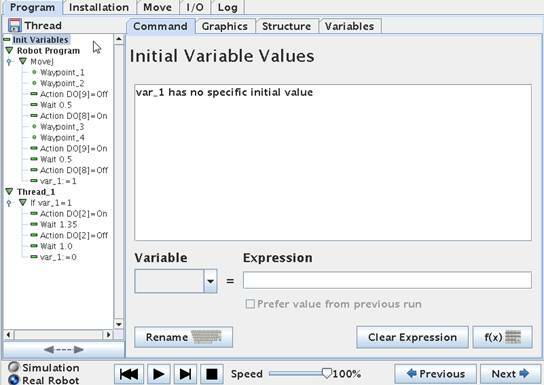 Before the program starts the variable ”var_1” is set to 0 in the Init Variables statement. 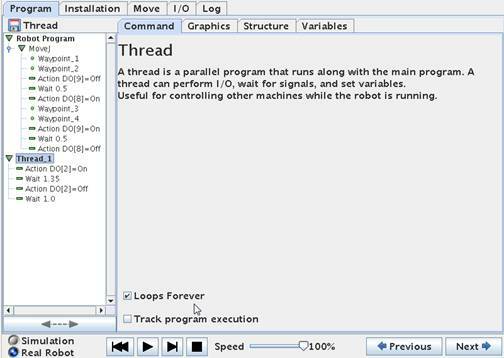 The Robot Program and the Thread is run simultaneously, but because the ”var_1” equals 0 the IF statement in the Thread is False at this moment so the conveyor is stopped. 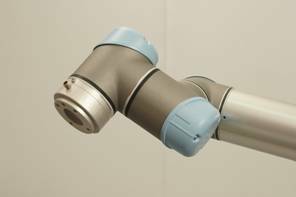 The main program start moving the robot from Waypoint 1 to waypoint 2 – then the DO8 goes ON which could be the gripper closing (In my case I have set the DO9 to go off because of the configuration of the valves I use to open and close the gripper). 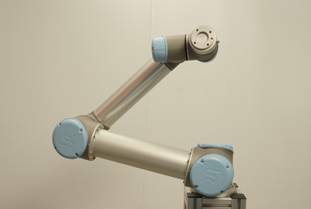 The robot move through Waypoint 3 and 4 – where I imagine the robot is now at the conveyor position ready to deliver the item – so the out put DO8 go off and DO9 go on. This will deliver the item onto the conveyor. Right after this I set the variable ”var_1” to the value ”1” because I want to flag to the Thread that the conveyor can move. 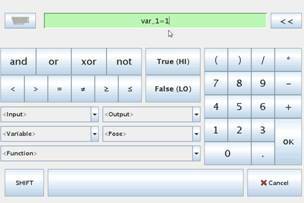 In the Thread the IF statement now see the ”var_1” as ”1” and therefore will perform our code inside the IF statement –which is to Start the conveyor DO2 is set to ON. We wait 1.35 seconds and turn the conveyor OFF again. And then the ”var_1” is set to ”0” because when the IF statement is checked again it is not False and the conveyor remains stopped - as we wish. 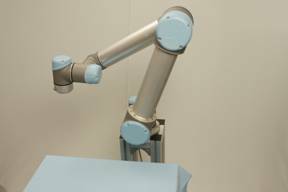 While the Thread is doing this and the conveyor is moving – the robot is long moved on in its cycle in the main program. 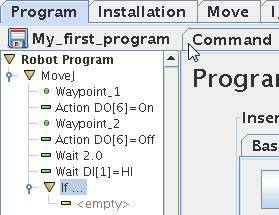 If a small Wait statement is inserted before the ”var_1” = 1 in the main program the conveyor has a delay before it starts and let the robot gripper get out of the way. 23.1 Placing the work pieces in rows on the conveyor. If you wish to place the work pieces in rows on the conveyor – maybe 2 rows or 4 rows etc. So in this example I will show 4 rows. Maybe in a pattern something like this. 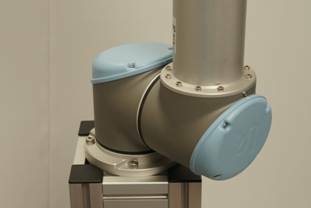 This means the Conveyor only have to move a notch forward in between 2 and 3. And again in between 4 and 1. 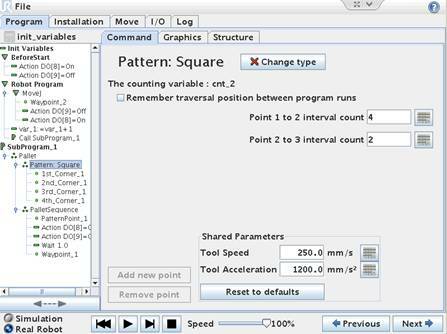 A way to program this is just to use variables and IF statements to keep track of the sequences of placing work pieces in this pattern in the Main program. 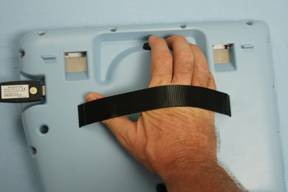 And then let the Thread take care of the moving the conveyor a notch forward. 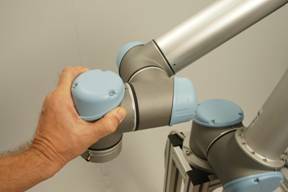 The Thread does actually not need to know the sequence of placing work pieces – the Thread just ON/OFF the conveyor according to the timing set inside the Thread. So the Thread will remain like in the previously example. (There are many different ways to do this – as many there are creative programmers). So far there is only one Waypoint for delivering the work piece because it is always delivered at the same position on the conveyor. In previous chapter this is Waypoint 4 that is the position for delivering the work piece. 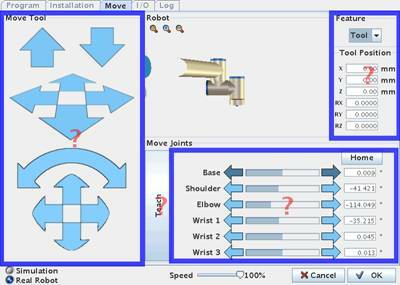 Now in this example we need 4 different waypoints for delivering the work piece on the conveyor because position 1 – 2 – 3 – and 4 are different. 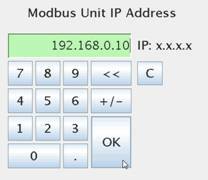 To keep track of the delivery position we can use another variable. Let’s get do some programming. The first part of the program is almost like before until we reach the point where we have to deliver the work piece onto the conveyor. However on top of the main program there has been an IF statement inserted which is to initialize our position counter. 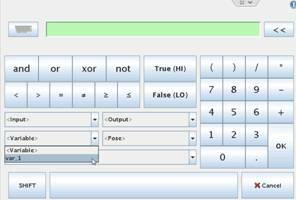 The position counter is a new variable called ”var_2”. 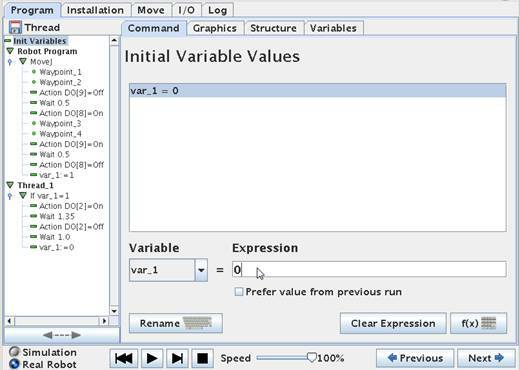 In the Init Variables block we set the ”var_2” to 0. 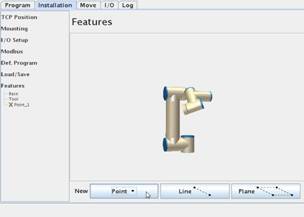 So first time we run the program – the variable will be 0 and thereby we know this is the first run and we can change the value to 1 so we can place the first work piece at position 1. 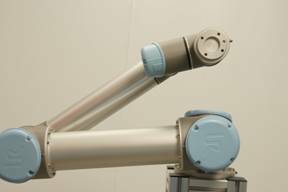 If we use the function to store values of this variable in between runs – then we can achieve that the robot can remember which position on the conveyor is the next position – this will be explained later. 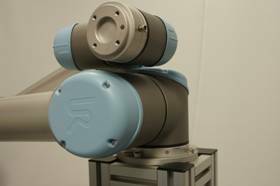 Since we have 4 different positions for the robot to deliver the work piece to - we have to create 4 waypoint for this position across the conveyor belt. These 4 waypoint will be in line across the conveyor belt because it is the moving forward of the belt that provides the zigzag pattern. So we will put the first at position 1 and then position 2 – move the conveyor a little forward – then put at position 3 and finally at position 4 and move the belt a little forward. 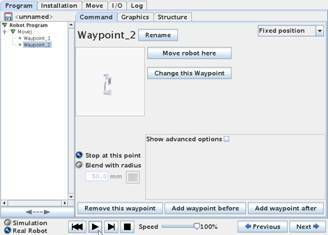 In the program I now call the waypoints 4_1, 4_2, 4_3, 4_4 just to illustrate that it is Waypoint 4 we are working with. There can be more Waypoints at these position e.g. an up and down and back up again for nice placement of the part. So before programming any further we will define the Waypoint_4_1 , Waypoint_4_2 , Waypoint_4_3 , Waypoint_4_4 where we want them to be at the conveyor. After the 4 Waypoints have been defined we will introduce 4 IF statements because we need to check where the next work piece have to be placed. 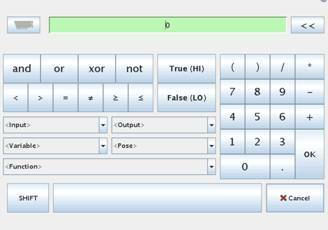 We introduced the variable ”var_2” for this purpose. 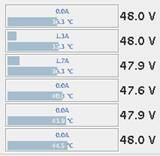 The ”var_2” can in this case have 5 different values i.e. 0, 1, 2, 3 and 4. The value 0 is to tell that we start all over again. At the first run the ”var_2” will have the value 0 – which is very quickly changed to 1 in the beginning of the main program. So when we come down to the IF statements the value of ”var_2” is 1. 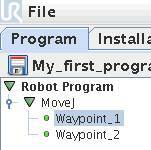 And the program under ”IF var_2 = 1” will be executed – which is to go over to Waypoint_4_1 and deliver the part. 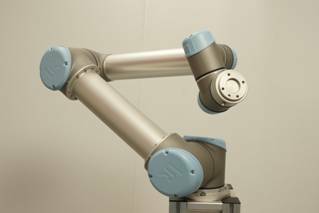 When the part has been delivered to Waypoint_4_1 the variable ”var_2” is set to 2 – to show the robot program that we have already been at position one and the next position in line is position 2. Notice how the IF statement of ”IF var_2 = 4” is on top and going down to ”IF var_2 = 4”. The reason for that is because we set the ”var_2” variable inside the IF statement to the next value – and if we had the ”IF var_2 = 1” on top down to ”IF var_2 = 4” – then all IF would be executed in a row because the change of ”var_2” will make it true for the next IF. That’s why they are turned upside down. 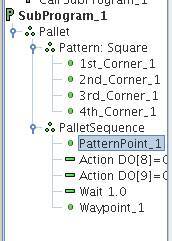 Leave the ”Check expression continuously” at each of these 4 IF statements in the main program unchecked. 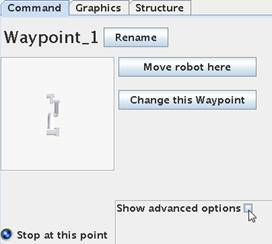 Since we only need to conveyor to move forward after position 2 and after position 4 the assignment of ”var_1” is only done inside the IF statement for Waypoint_4_2 and Waypoint_4_4. 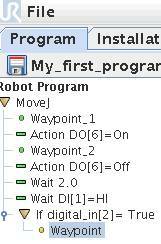 So the IF statement inside the Thread is only true after the robot has delivered to Waypoint_4_2 and Waypoint_4_4. 23.2 Variables – Prefer to keep value from last run. 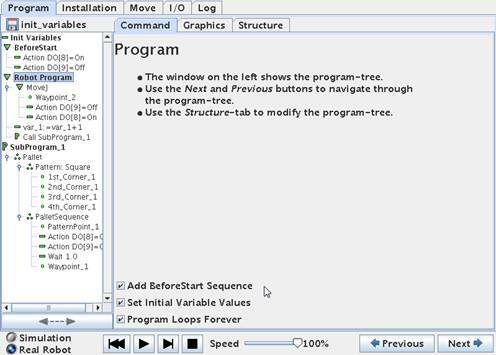 24 Programming – Lesson 10 - Advanced – Script Programming. 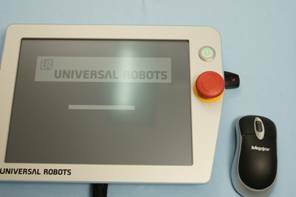 So far we have used the touch screen teaching pendant on the Universal-Robot to make our robot programs which is very convenient and easy to build up programs. 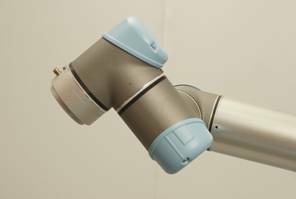 But sometimes it can be desirable to be able to make the robot program on a host computer and just communicating and sending commands from the host computer or PC via an Ethernet socket connection directly to the robot motion and action control without using the teaching pendant. 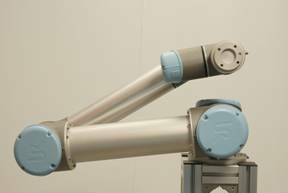 For example if the robot is part of a big complex installation where all equipment are controlled from the host computer or PC. 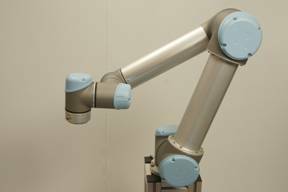 Another advantage by doing this is that the program can be further developed, edited and tidy up while the robot is running production. 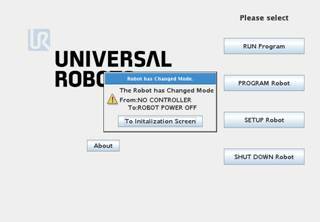 Then when there is a break in the production the new modified program can be activated and control the robot right away (provided the programmer did not make any programming errors in the new version). Another advantage is that the host application programmer can make new functions and features by himself and basically create a complete new user interface and functionalities to the robot and handling of his data and interfacing with even other computer systems to his creativity abilities. 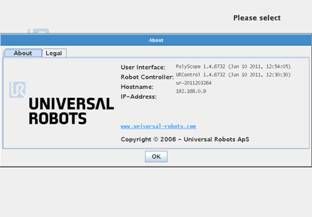 The Universal-Robot offers such possibilities to make remote script programming with its build in script interpreter. 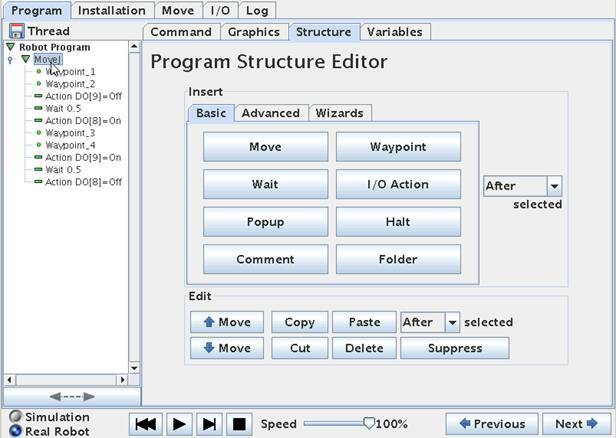 The choice of programming environment on the host computer is up to the programmer and typically programming languages such as C++, Java, Visual Basic, and Python or similar is the choice, but even Notepads can be used as an editor. 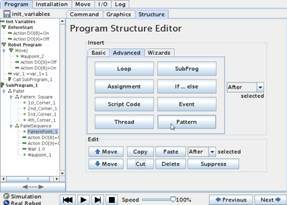 But before jumping into the remote script programming there is also an alternative script programming method provide by the teaching pendant as well which is also very useful. With this method it is possible to Import Script statements or whole Script files into the robot program created by the teaching pendant – so this method is something in between using only the teaching pendants program objects and the fully remote Script programming. This method will be explained first. 24.1Script programming from the teaching pendant. In this method of script programming you still need the teaching pendant, but this function is very helpful and makes it possible to edit part or entire program on another computer while the robot is running production. 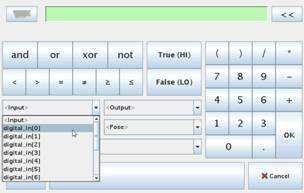 This function can be used extensive script programming, but also just as a method to manipulate variables, input/output states and especially timers. This makes the programming very elegant i.e. 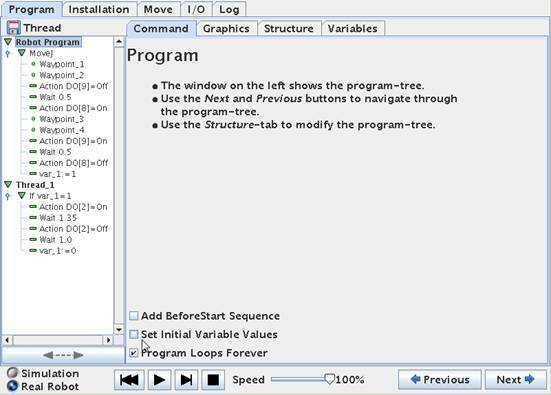 the program tree is the overall pattern and flow of the program whereas things that can change such as variables I/O and timers are kept in separate blocks. 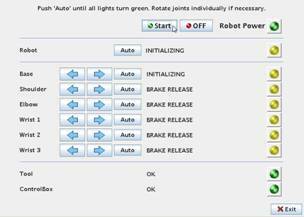 In this way the commissioning and adjustment can be done in these blocks without touching the program flow. 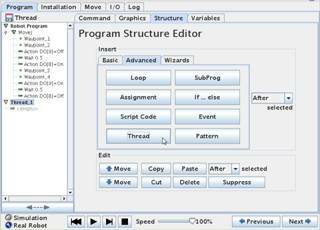 In the Advanced program menu under Structure section the Script Code object is located. 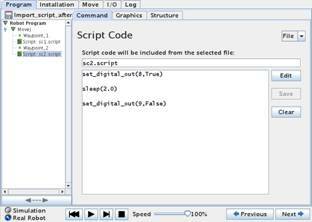 This object will insert at “Script:” entry into the program. Note it is still yellow which means we have to define it. To define the Script entry in the program – point on the Script line to define and choose “Command” on top of the menus. 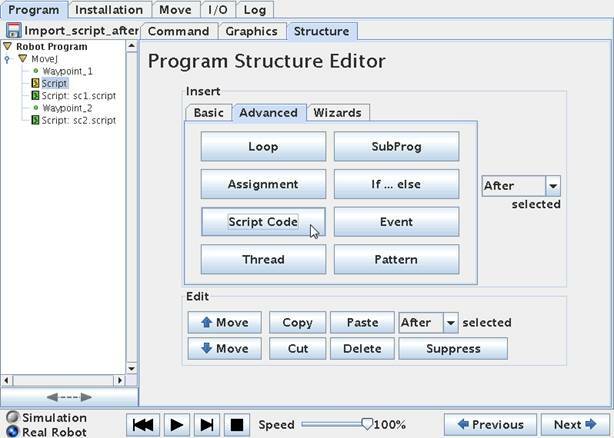 However before we proceed with the programming we need to prepare our Script file – otherwise there is nothing to load so let’s step a little back to the point where we have no Script entries in the program tree and just two simple Waypoints. 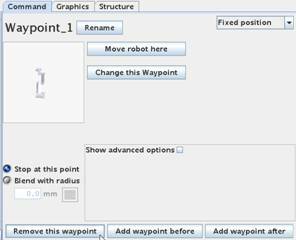 I am planning to change 2 outputs in between the two Waypoints and after the last Waypoint before the program goes back to Waypoint 1. 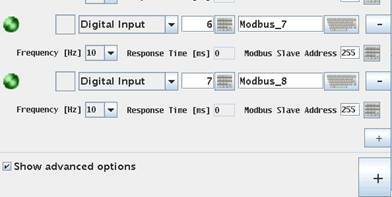 And I need a delay in between the change of the 2 outputs – note the second delay is 2 seconds whereas the first is 1 second. This could also be done by using the traditional teaching pendant method and it would look like below program. 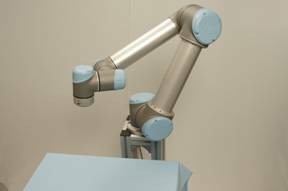 But in this case we want to use the Script method so we have a separate Script file with our variables for later adjustment opportunity while the robot is running production. 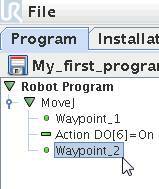 So before we go any further we only have a small program with 2 waypoints. Now we need to prepare the separate Script file. 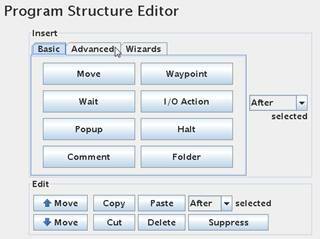 The format of the Script statements can be studied in the Script manual, but a very useful method to learn about the format of a Script language is to open a Script file the robot already have provided from previous created program. 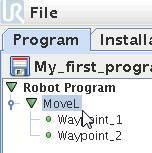 Remember the robot creates three files every time a program file is saved – a x.urp file which is the robots main program file – a x.txt file which is a very simple text file to illustrate the program flow and a x.script file which is the actual program in script format. Try and open such an x.script file in a simple editor e.g. a Notepad and study the contents. Don’t dwell too much into the details at this stage of this script file and may just study a single line statement e.g. the “set_tool_voltage(24)” which sets the Voltage on the tool to 24 Volt and compare to the explanation in the “scriptmanual_enx.x” document. 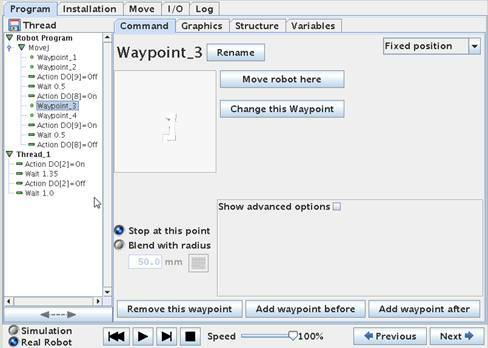 Note that in this case the robot has wrapped the Script code around with some initial definitions that you do not see in the tree structure, but that’s default robot settings and also comments like “$ 2 "Waypoint_1"” – this you might or might not need in your Script file depending on your complexity of your Script program and also because we are inserting Script code into a part of a already existing robot program and therefore some of these wrappings will be duplicated and cause program errors – so in this first simple case we do not need it. 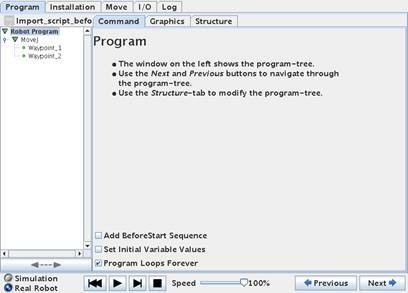 In our case we just need two script files because we need to insert Script code at to different locations in the program i.e. 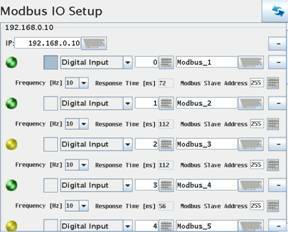 in between the Waypoints and after the last Waypoint – and we need two files because they need different contents because we swap the status of the outputs. 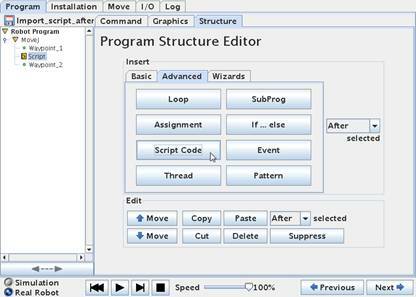 Some we will now prepare the Script files on a PC computer and we just use a simple editor such as Notepad to create these two files. 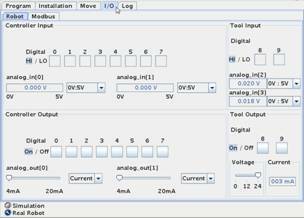 Note that the two outputs have swooped states and the delay has increased from 1 to 2 seconds. Also note the two files has different names i.e. sc1.script and sc2.script. Also note how the “Wait 1.0” functions is now called “Sleep(1.0)” which is in line with standard Script language. 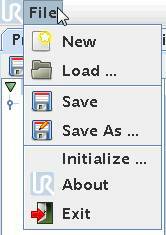 So now instead of programming these functions in the program tree we want to import these files instead. 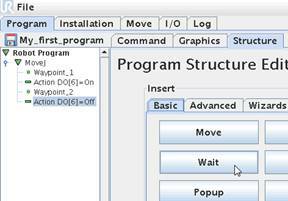 Now we can proceed to insert a Script: statement into the program tree by picking it from the advanced program object menu and it comes into the program as yellow because so far it is undefined. 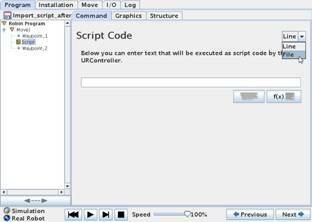 Point on the “Script:” statement and choose “Command” screen. 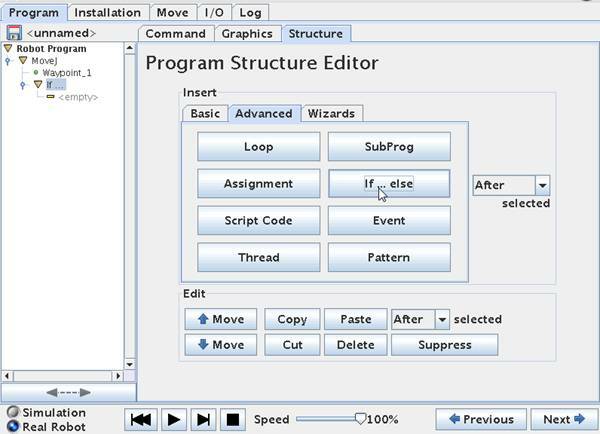 In this screen the Script function is defined. 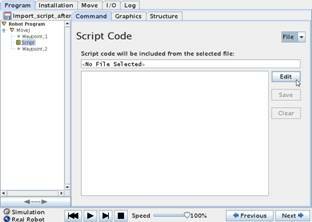 On the right hand side the amount of script commands are chosen i.e. 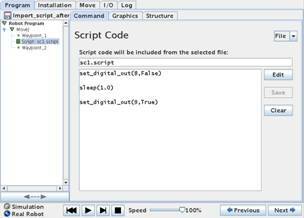 only one line of script code or from a separate file containing maybe several script commands. 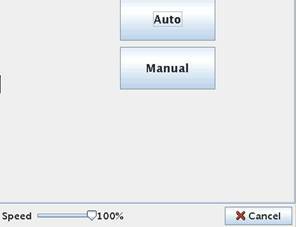 In this case we choose file because understand file will also explain a single line – and the right screen appears. So far no file has been chosen – hence there are no script statements. Choose “Edit”. 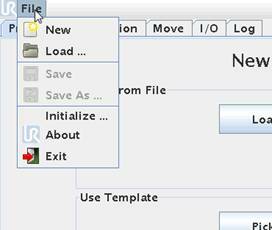 Then choose “Select File” which will bring you to the file menu where you can navigate to your file destination of your prepared Script program block. 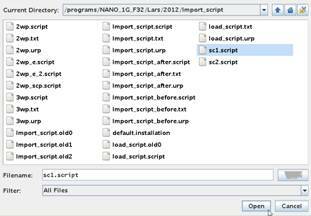 Then choose your intended Script file and choose Open – in this case the sc1.script file we have prepared and choose “Open”. This will open your Script file. 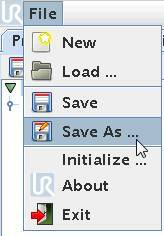 Choose “Save & Exit” which will complete you’re “Script:” statement in the program tree and therefore turn green. Note how the contents of the Script file now have entered into our program under the Script: statement. 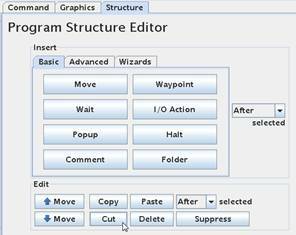 Now follow the exact way to insert a second “Script” statement under Waypoint_2, but this time import the script file “sc2.script” instead. 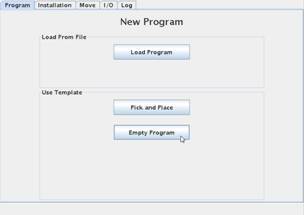 Then your program should look like this. 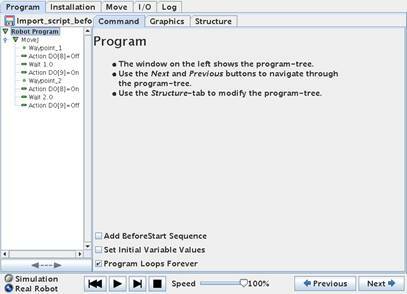 Now try to test run your program which behave exactly like if the outputs and wait has been made in the tree structure. 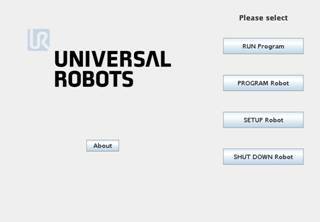 Save the file which of cause will create three new files x.urp, x.txt and x.script which now has the entire program inside including the Script files interpreted by the Robot. Note how the content of our two script files has been inserted to the program (marked with yellow). The big advantage now is that we still have our two script files we can edit with an editor on another computer and make adjustments to our variables e.g. 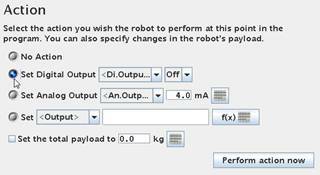 if we want to change output or change timer values it can be done while the robot is running production and then when there is a break be loaded into the robot program which can immediately be started. 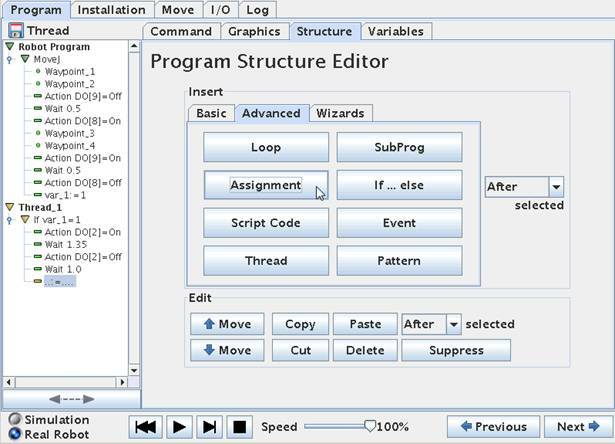 It is possible to have the entire program as a script file and import in this way – so the tree structure will only have one statement – a Script: statement where the entire program is in a script file and thereby loaded into the robot. 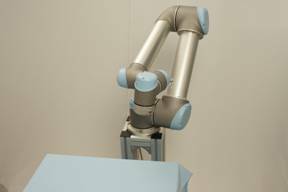 But in such case some of the wrappings and comments has to be removed from the script file format the robot create by itself in order to avoid double definitions. 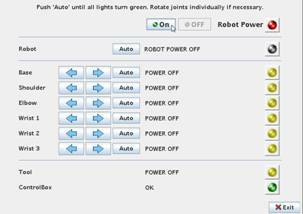 24.2 Script program by Socket connection - Host computer to UR robot #1. The previous chapter used the “Script:” function available in the teaching pendant to import blocks of Script code or entire program into the robot and run from the teaching pendant. 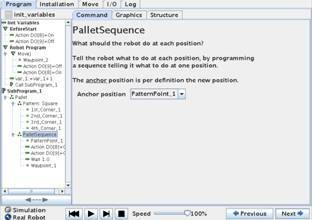 In this chapter we will focus on making a script that entirely control the robot remotely from a host computer by Script programming. 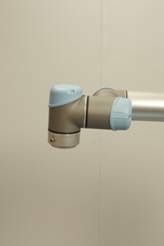 The format is the same as in previous chapter and as documented in the Script manual, but since we are not using the teaching pendant we need to send the Script file to the Robot control through an already prepared open port on the Robot which is TCP port 30002. 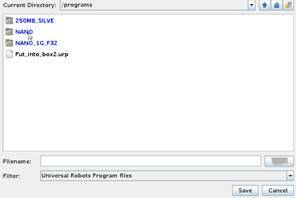 In this case we are using the program language Python and the Python environment to communicate with the Robot. 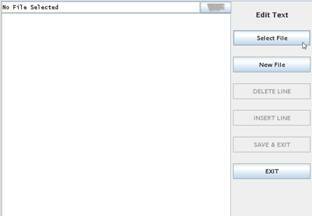 The Script file can still be edited in a Notepad. 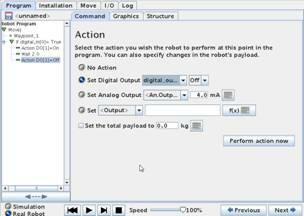 The first program example is just to illustrate how to send a script file through via the Ethernet to the TCP port 300002 on the robot. 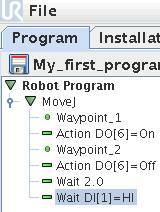 The first Program 1 just turns digital output number 2 ON and the robot does not move at all and the program looks like this. 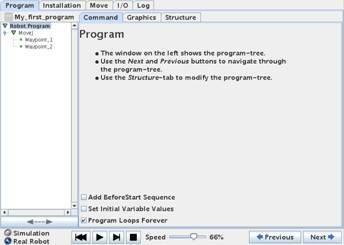 The program is run from the host computer and will only have one passage because there is no loop in the program. 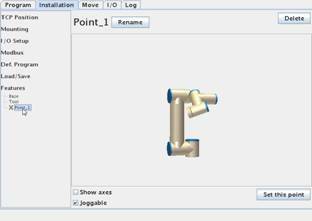 The library “socket” in imported into the program so the Socket connection is available. 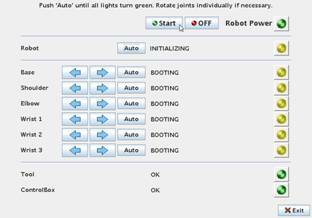 The “Host” in this case is the Robot and “PORT” is the open port on the Robot that listens for Script code. Then the Script code necessary to connect and send on the Socket. 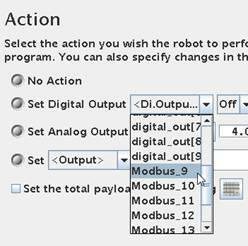 The “s.send” command send that actual script code for the robot to execute which in the case is ("set_digital_out(2,True)” Which is like previous chapter. The + "\n") at the end of the line is a linefeed because the Robot need a linefeed after each command. The Socket connection needs to be closed again with the s.close() command. 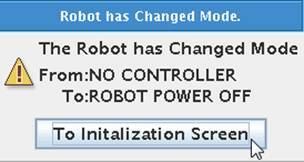 The print ("Received", repr(data)) command prints the output from the robot on the Host or PC monitor – in this case acknowledgement code. 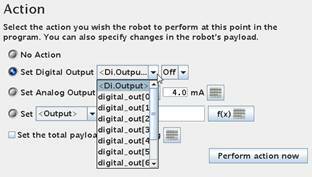 The second Program 2 is similar and just turn digital out number 2 OFF again and the robot does not move at all. 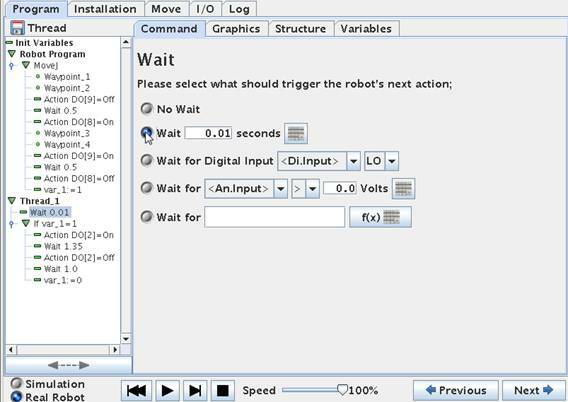 24.3 Script program for Socket connection - Host computer to UR robot #2.
print "0.2 seconds are up already"
print "Starting Program" (This is printed on the PC Computer from where the script program is run). 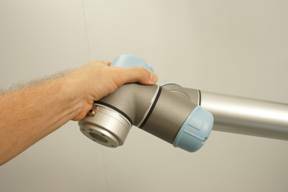 s = socket.socket(socket.AF_INET, socket.SOCK_STREAM) (All line that is indented under the While statement is executed in the loop). 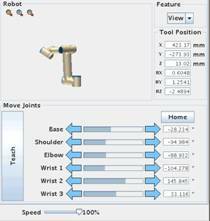 (Second joint at -90 deg t = (time to reach this r = (Blend radius is set to 0) . waypoint is 4 sec) . 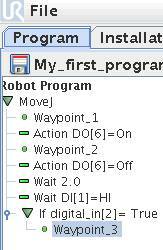 time.sleep(4) (Program waits 4 second because it takes 4 seonds for the robot to move to the waypoint). 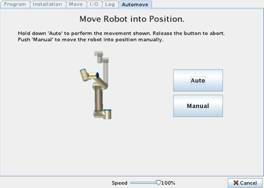 The Features screen in the ”Installation” screen is a option to define the robots movement to user defined relative points. 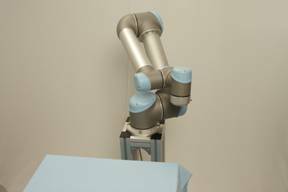 If the robot is mounted like on a table top mounting the ”View” feature relative is like you see (observe - view) the robot and when pressing the ”Up” the robot moves straight up and when pressing ”Down” the robot moves straight down. Choosing ”Base” feature will be the same in this case if the Robot is mounted as table top mounting, but different if the Robot is mounted on Wall or Ceiling or in an angle. 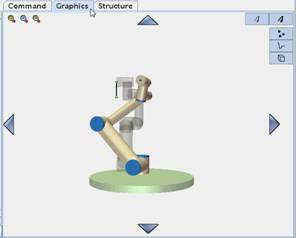 Observe the Graphics on this screen which shows the tool head like it is vertical to the horizon, but a closer look will reveal that the base is in an angle and therefore the graphics will show the robot head go up and down, but by observing the robot the head moves in the tool head score plane. 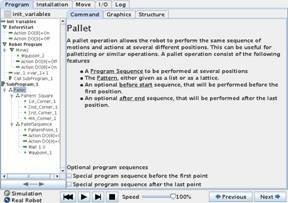 This is useful in programming the robot if we are moving relative to an object. We can also define our own relative points – or line or plane. Go back to the Feature ´s in the Installation screen. Below press ”Point” which will insert a red ”X” under Base called Point_1. It is red because it is not yet defined. 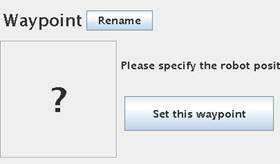 Point on the red ”X” and pres sit which brings this screen from where you can define (Set this point) like setting a waypoint. 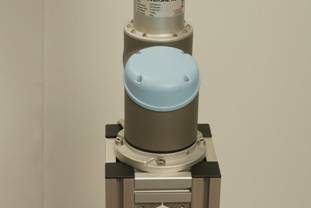 Digital Outputs on tool head are Open collector type. 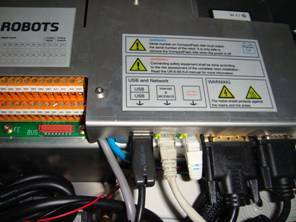 Open collector means that the outputs are implemented to ”sink” and we can say they are ”Active low” because connecting an actuator can be done by applying the supply voltage at the ”far” end of the actuator connections and the other connection to the output terminal - and then when the output is driven low by the programmer – the external device turns on. 27 Potential Free interface with other equipment. 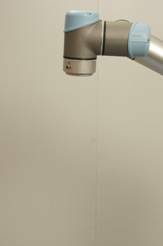 The method of "Potential Free" signal exchange is very elegant because we don’t mind if one machine is 12 Volt and the other is 24 volt - we just detect when the contact set open and close with our "own" power on the machine we need the information. 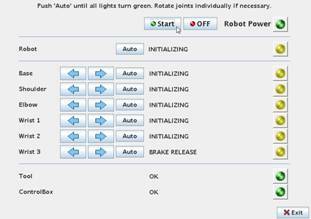 This principle of Potential Free handshake is also advisable to use for the normal Start and Idle signals i.e. 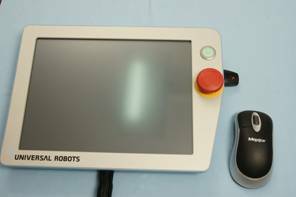 the Start signal on the CNC machine should just be a dry contact controlled by a relay on an output on the Robot. And the Idle signal should just be a dry contact (controlled by a relay - e.g. via the beacon) on the CNC machine. That’s "Potential Free" signal exchange and the Power Supplies on the two machines is not connected at all, but we still have handshake through the dry contacts. 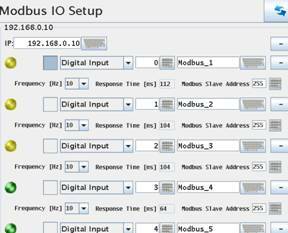 28 Extension of I/O interfaces by MODBUS nodes. 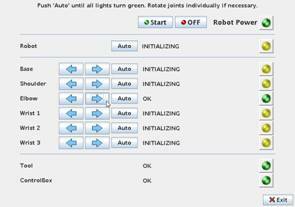 If there is yellow light in some Modbus nodes representation in the UR robot menu (not on the node) then the frequency has to be reduced until all in/output is green - properly 5 Hz is recommended. 30 Force feed back and Safety stop. 31 Connection of Light Guard. This You tube video shows how the light guard can be applied. 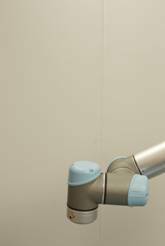 Note that when the person enters through the light guard – the robot stops. 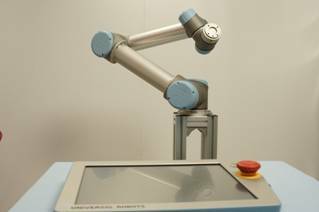 Only when the person leaves the area and press the reset button which is outside the area – the robot continues from the position it stopped. 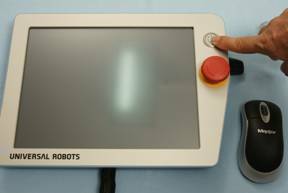 Please note that the Green and Red light you see at the reset button are controlled by the relay on the light guard – i.e. not by the robot. When the light guard output is high a relay is activated and when the output is low the relay is deactivated and the contact associated with the relay controls the red and green light. 32 Connection of External Emergency stop. When connecting an external Emergency Stop or interconnects the Emergency Stop circuit with another machine there is something about potential free connections we need to consider. 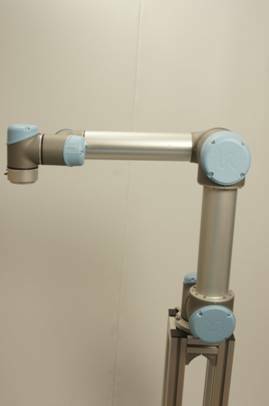 In this example we consider a CNC machine as the “other” machine to interconnect the Robot Emergency circuit with. 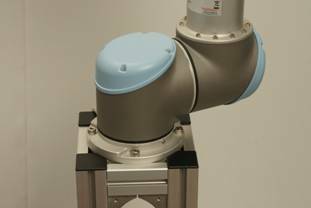 We actually don’t want to mix the power voltage on the CNC with the Power voltage on the robot - nor do we want to mix the GND on the two machines. 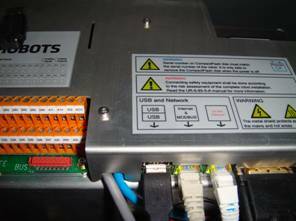 Because if we mix the Power voltages on the machines - the internal Power supplies could start fighting and there could be a risk of damage if there for some reason was a difference in the voltage levels. So in a case where there is 12 Volt DC on one machine and 24 Volt DC on the other machine is a good example where we do not want to mix such power levels because then we could damage the electronic circuits - and then it is good we have a method to overcome that. 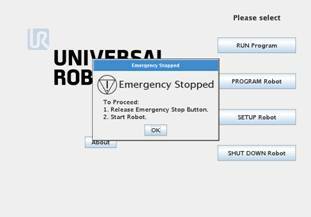 Another fundamental thing that is important to know is that we normally say that Emergency stop is to protect humans from danger - so when we see a danger we can press an Emergency stop and the machine stops. 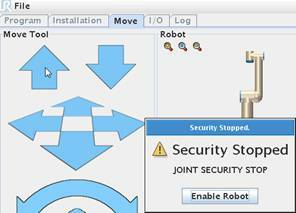 And the Safety stop (as explained in previous chapter) is a controlled method to protect the machine and humans form a potential damage. This fact is very important to remember when we are working with these two different safety functions and why there are different level of severity to these circuits - because we can easy understand that the Emergency Stop circuit has the highest and most severe rules to comply to because it deals with protection of humans. However the basic of the circuits and how they work are very similar principle which is the principle of Serial connection of switches that all have to be closed to have a normal operational condition. As soon as the loop i.e. 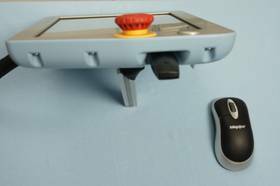 the Serial connection is open at any place - the Safety circuit detects that and we activate the Emergency Stop or Safety stop. Next important thing to know is that Emergency stop circuit has to be hardwired i.e. 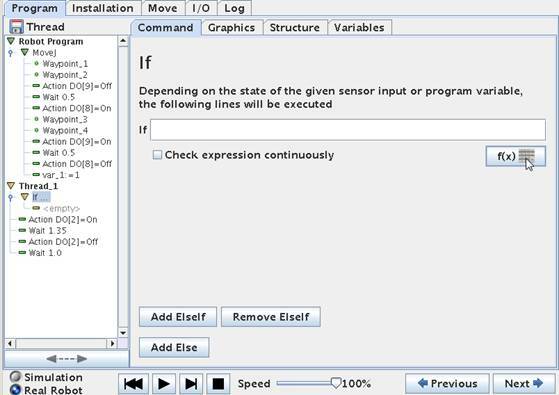 it cannot be programmed - for example sending a Emergency stop switch to a PLC input and then the PLC program perform the Emergency Stop routine - this is not allowed because then there would be two main risk - either the risk that the programmer made an error so the program does not detects the input change - or there is the possibility of a PLC error and if someone presses the Emergency Stop, but the PLC is in error then the Emergency stop routine will not happen - this is not good. 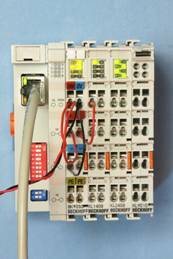 Therefore Emergency stop circuits has to be made of approved and certified components the comply with the highest class (standard) of safety. This means it is not good to insert or make to much modification to emergency stop circuit - unless we use approved equipment - that is Emergency Stop relays. Such functionality is often build into nowadays standard machines. Also what is important to understand is that when talking about Emergency Stop circuits we normally has two loops for the highest class of safety - the reason for that is to be sure to detect an Emergency stop situation even if there is error on the equipment. Consider a contact set is hanging inside the Emergency stop pushbutton - and when someone press the contact still hangs - and no Emergency Stop is detected - that’s not good - so instead there must be two contact set in a good Emergency Stop circuit for each pushbutton because if one contact is hanging - then the other contact will properly still work when someone press and the Emergency stop is detected. 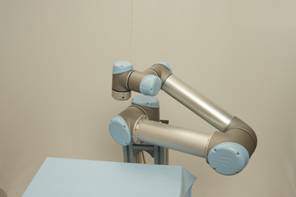 Remember that we need two loops - so that’s why you see two sets of TA - EA, TB - EB and TA - EEA, TB – EEB inside the robot cabinet. On the top left figure you see the External Emergency Stop “jumped out” i.e. there is no External Emergency stop used (That’s how the robot is configured as standard) - only the internal Emergency stop is active (the one on the display) which is wired internally in the Robot). TA feeds EA and TB feeds EB and the same on the second set of TA - EEA, TB - EEB. 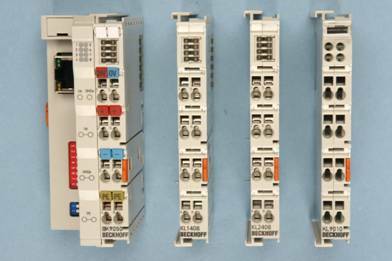 (EA-EB and EEA-EEB are Emergency Stop approved inputs) and at any place this serial connection is open - we detect an Emergency Stop. So actually what you see is that TA-EA and TB-EB is logical short circuit because of the red wires mounted and same goes with TA-EEA and TB-EEB. That’s what the internal circuit likes when there is no Emergency Stop - as soon TA-EA or TB-EB or TA-EEA or TB-EEB is no longer logical short circuit - we detect an Emergency Stop. Any of the four open will trigger an Emergency stop. On the top right figure you see a configuration of an external push button applied. 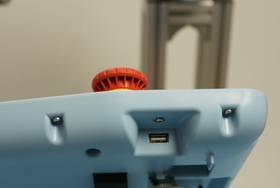 This is an extra Emergency Stop Push button (not the one on the CNC machine) in case you would like to have an Emergency Stop push button somewhere else than on the Robot Monitor. 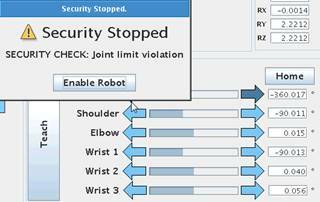 Notice how there is two sets of contacts according to highest Class of safety - and if just one of the contacts open - we detect an Emergency Stop - and the robot Stops. Please note that you still need the jumper TA-EEA and TB-EEB (not show on the drawing) – otherwise there would be an Emergency Stop triggered. One important thing to be aware of is that if TA-EA or TB-EB is open – then the internal Emergency Stop relay is open i.e. E01-E02 and E03-E04 contacts opens. Whereas if TA-EEA or TB-EEB is open - then the internal Emergency Stop relay is not open i.e. E01-E02 and E03-E04 is still closed. (This is useful later when we connect to another machine). 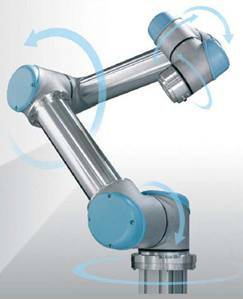 This figure shows an example how two machines can be connected together - and this is what we need in this case. 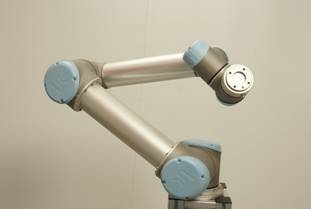 The example speaks about two Robots connected - which are also possible, but in our case we have one CNC machine (A) and one Robot (B) to connect, but it is still the same principle. 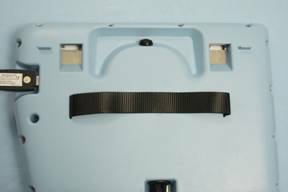 So far you can see the terminals E01, E02, E03 and E04 have not been used, but we are going to use those now. This is just two contact sets E01-E02 is one contact and E03-E04 is another contact set. These contact sets are normally closed - and both contact sets also opens when there is an Emergency Stop condition. This is great and we can use that to tell another machine that there is an Emergency stop on the Machine which is holding this contact set. Consider that we have both an External Emergency Push Button (left figure) and we also have a interconnection with another machine (right figure). Remember that TA-EA and TB-EB and TA-EEA and TB-EEB need to be short circuit to have a normal condition without Emergency Stop. So follow the wire from TA on machine "A" down to “first contact set” of external Emergency Stop and back to EA. Same - follow the wire from TB on machine “A” down to “second contact set” of external Emergency Stop and back to EB (The two loops are closed). Now follow the wire from TA on machine “A” over to E03 on machine “B” through a closed contact to E04 and back to EEA on machine “A”. 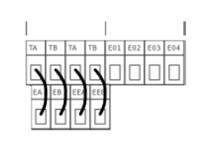 Same – follow the wire from TB on machine “A” over to E01 on machine “B” through a closed contact to E02 and back to EEB on machine “A”. The two loops are closed. 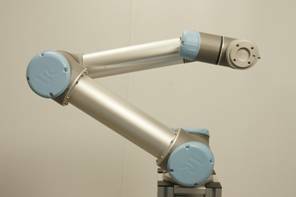 The same principle for machine “B” over to machine “A”. 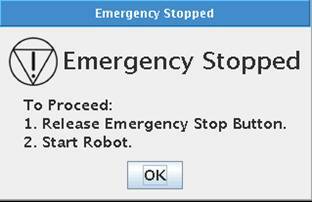 Now consider an Emergency Stop on machine “A” or a External Emergency Stop on machine “A” – first of all it stops machine “A” – and because the internal Emergency Stop relay on machine “A” opens up E01-E02 and E03-E04 - it breaks the loop of TA-EEA and TB-EEB on machine “B” – so machine “B” also stops. 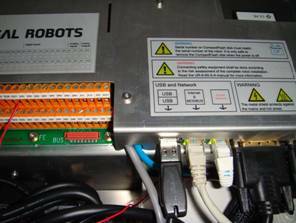 Now – because we used TA-EEA and TB-EEB as the loop to break on machine “B” – it causes the machine “B” to stop OK, but the internal Emergency relay on machine “B” does not open E01-E02 and E03-E04 on machine "B". That very good because now we can reset the Emergency Stop on “A” – which closes E01-E02 and E03-E04 on machine “A” - which cause the loop TA-EEA and TB-EEB on machine “B” to close – and both machines can restart. 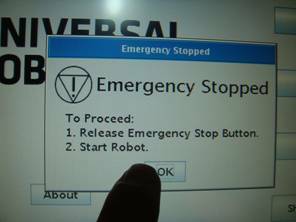 (Note: If the Emergency stop relay had opened on the machine "B" - which is the machine without the real Emergency Stop pressed – then we would not have been able to reset again – because both machines would held each other “open”, but now we can). It is possible to have almost as many extra Emergency Stop as you want (only limit is the resistance in the wire and contacts.